First of all can I thank everyone who contributed to the discussions following last week's news post. The most comments ever for a post and all of them polite, even when disagreeing. It was a joy to watch them all come in and read them prior to publishing. Some valid points made from all sides of many arguments. 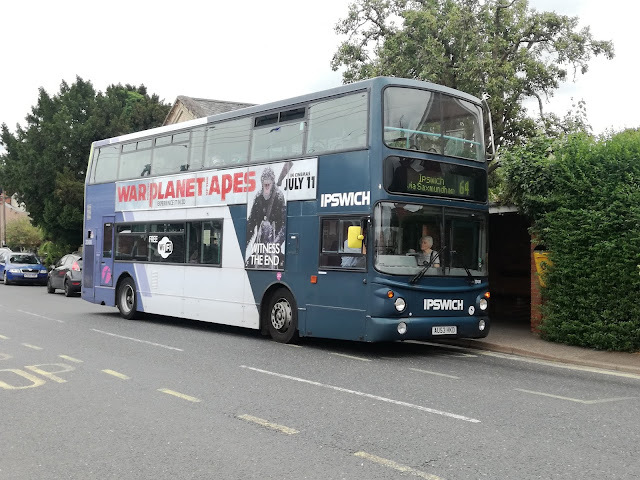 So it's only right that I start today's post with news relating to a fair chunk of those comments, Ipswich Buses. 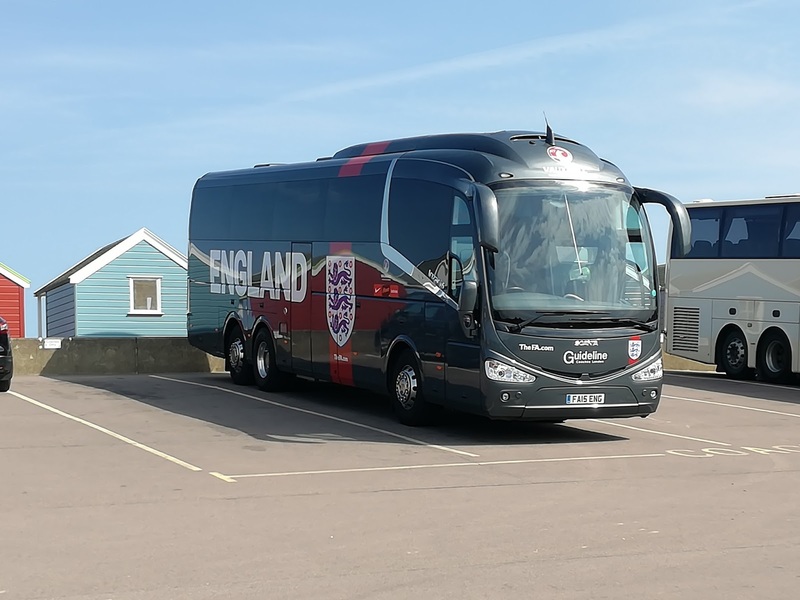 Quite a few people mentioned IB's fleet, the ex Carters fleet in particular, someone even saying he had heard they were going to be replaced with Scanias. Well it turns out he was right, and then some. 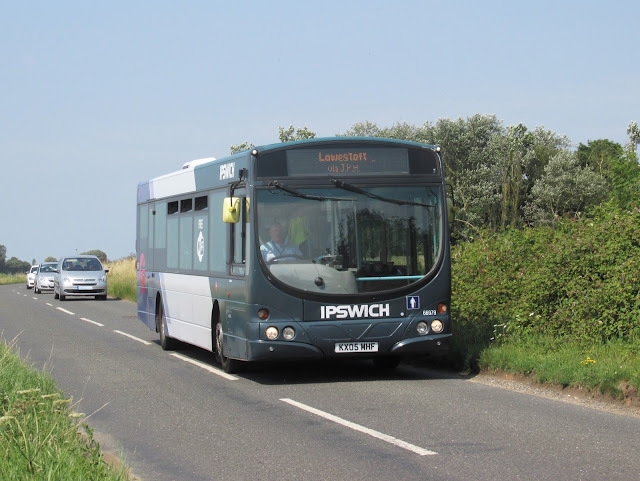 I was informed today that Ipswich Buses are getting fourteen 61 plate ex London Scanias. I don't know full details yet, but obviously 14 buses will cover far more than the ex Carters fleet. What remains to be seen is what IB will be doing with them. I assume, like the Borderbus Scanias they will be converted to single door, and I can only hope for the sake of the passengers on the 93 to Colchester, that they have padding put in the seats. IB are normally pretty good with their choice of seats, so if anyone within IB reading this can confirm I'll be grateful. When I get more details obviously I'll publish them. It turns out all my Star Trek references to the BCI First trialed on the X1 were wrong. 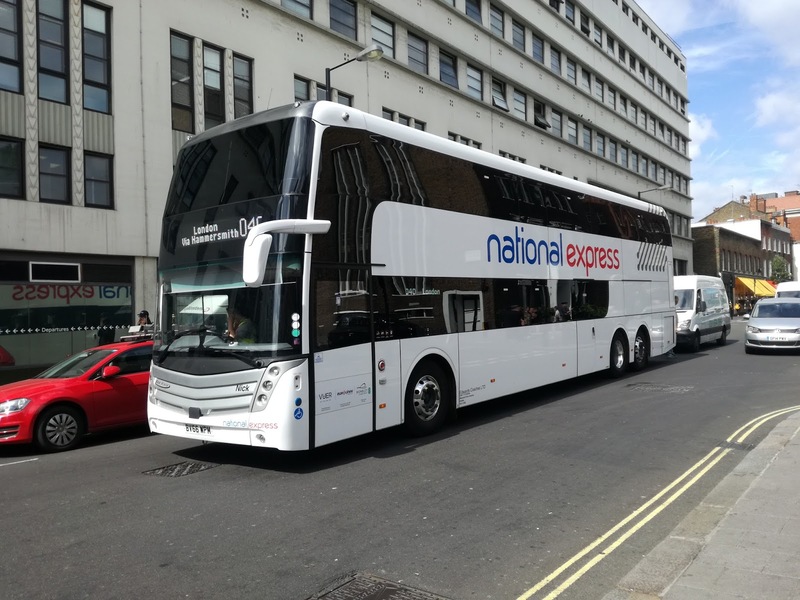 The tri axle version, which First are due to trial in August is the Enterprise, the two axle version being the Excellence, which has got to be the most risky name for a bus ever, and asking for trouble! Anyway, a closely guarded secret was that Borderbus, never shy of trying out a demonstrator, were getting one this week, and it duly arrived yesterday when I was in Sussex! So this morning I was over the depot pretty early (for me) only to discover it was already out on the road. A quick chat with everyone, of which more later, and I rendezvoused with the Excellence at Kessingland. I was hoping the vehicle Borderbus were given was a different one to that First had, and so it was. This meant I could compare the two. I was also lucky enough to have a vastly experienced driver of 37 years driving and instructing who has torn the other demonstrators to bits, so I knew he would pull no punches. Exactly what I needed as it's ok for me to say what a great bus, no rattles blah blah but the most important person on board is the driver (certainly was when I was driving) and what they think matters. Jed thought for a moment when I asked him what his initial opinion was, then said "I wouldn't mind a fleet of them". That is high praise indeed, and I have to say the ride impressed me once again. The pot holed roads between Wangford and Southwold can shake you to bits on an E200, but the Excellence glided over them as if they weren't there. Good stuff. On arrival at Southwold Jed took me through the points he'd noted that he thought could be improved. Firstly the handbrake. 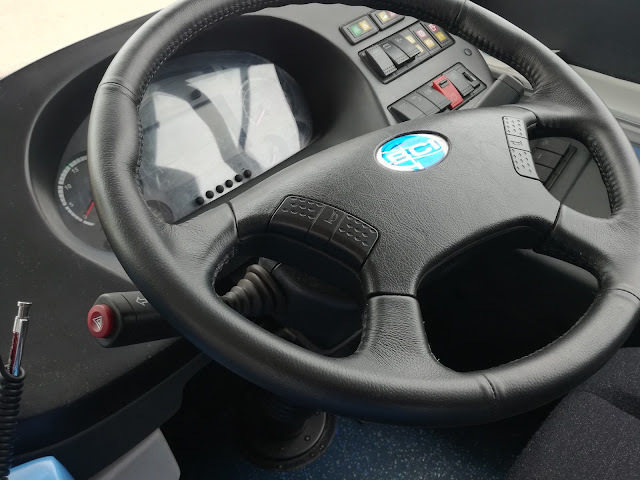 A very minor point, but on most buses you put the hand brake on, then have to lift the neck up to release it. On the Excellence you have to lift the neck up to engage it too, and that takes some getting use to. The interior mirror is far too big for it's position, and actually creates a blind spot out of the windscreen. Jed thought positioning the mirror higher above the windscreen would make things easier. Only half the cab window opens - the rear half - which makes adjusting the offside wing mirror awkward. Jed isn't a short chap by any means and he had trouble. Allowing the front half to open too would solve that problem. His biggest gripe though was the bell, which was exactly the same noise as the indicators That is very confusing if the bell is pressed while indicating. I was convinced the example First had, had a normal bell, and Cameron, who was with me on it, has confirmed that. That really needs to be changed, as it will confuse passengers too.. The only other problem Jed had was with the low ceilings. For a 14'6 bus the ceilings do seem low, and neither of us could work out why, unless it's not 14'6 of course! But one thing Jed was impressed with was the positioning of the hazard warning lights switch - on the end of the indicator stalk. Believe me if that's all Jed could find to criticise then we have a very, very good bus. He said the braking was extremely good, and acceleration matched an E200, yes 200. It felt solid, and the more he drove it the more he liked it. I must mention the interior lights, that come on very slowly but have a trick. 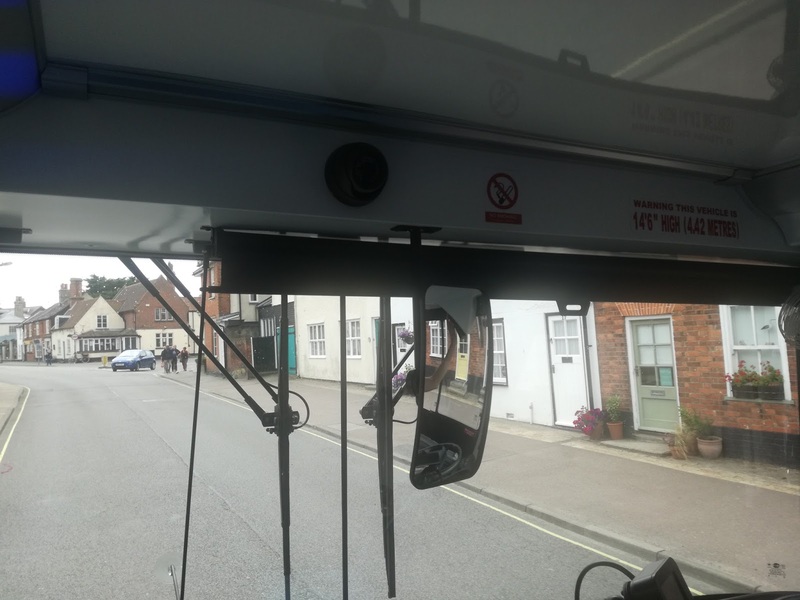 The lights above the door and luggage rack are blue to reduce reflection in the windscreen, but as the doors open they change to white, then back to blue when the doors close. Very well thought out that. Oh just one more thing - the wheelchair arm is positively lethal! It seems to stick out further into the gangway than others and the height of it is such if someone was thrown forward, especially a male, then any future prospects of fatherhood could be seriously impaired. I'll try and get a pic while the Excellence is here, and no one knows how long that will be, could be a week, could be all Summer! So in conclusion overall I was just as impressed with the Exellence second time round as I was first time, and just those small details to sort out. Do that, and BCI might be tempted to change the name from Excellence to Perfection! While I was at Borderbus I had a chat with supremo Andrew Pursey who confirmed Borderbus are making no service alterations this Autumn. 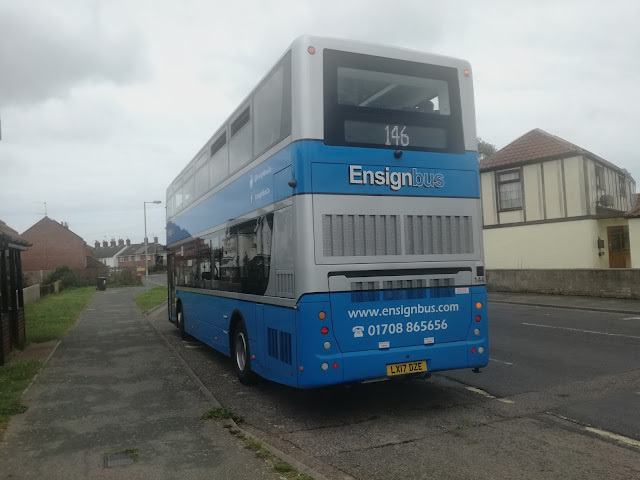 The 146 is growing patronage steadily, and it wouldn't surprise me if by this time next year some of the E200's are gone and replaced with deckers. In a world of cuts it's so good to see a route bucking the trend. There is also a big waiting list for the Sir John Leman High School buses, with some 650 pupils a day conveyed to and from the school. So from the Excellence to the anything but excellence. 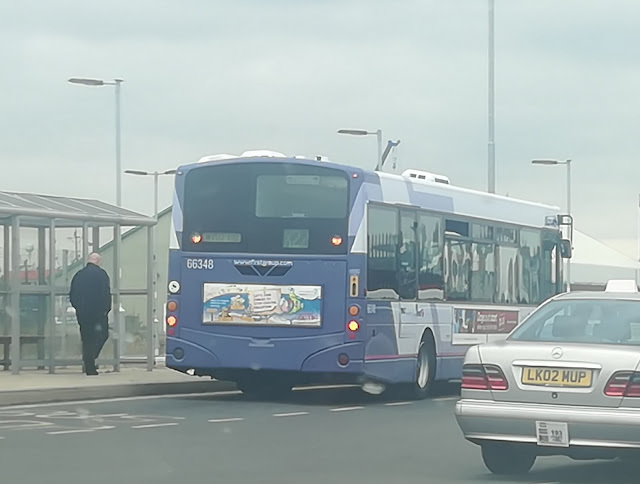 Passing Lowestoft Station I spotted ex Norwich Volvo B7l 66348 on the X22, the only bus with harder seats than those Scanias! A hastily taken pic while at traffic lights but rather pleased I hadn't travelled from Norwich on that. 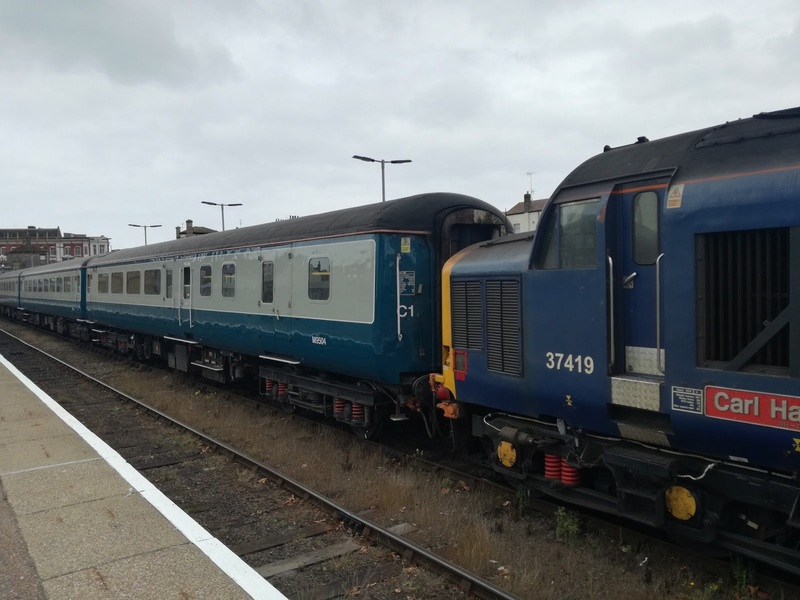 I'm told by Grahame Bessey that it is probably on loan from Great Yarmouth to cover Dart 42908 which is away for repaint. Even stranger was seeing a Gemini on the Town Service 106, so why the rattlebucket was on the X22 is anyone's guess. 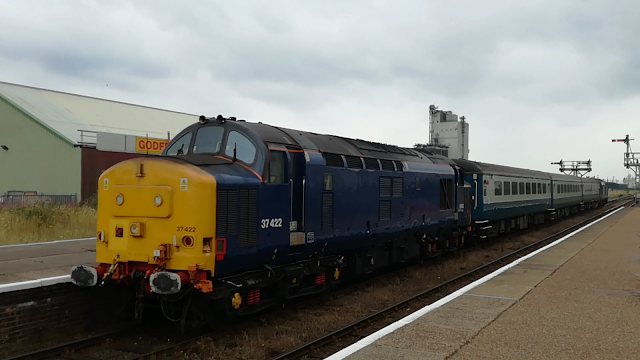 Last week I promised news on the Class 37 hauled Short Set running between Norwich and Great Yarmouth/Lowestoft, and here it is. The DRS coaches have been temporarily replaced with 3 blue/grey (It's blooming white not grey) coaches making the set look even more retro. I was going to take pics tomorrow, but Tim rang me to say he was at Lowestoft Station so it seemed rude not to return and see it today. And what a sight. Could have been any day in the last 40 years. Long may they stay on the set, and we now need 2 large logo locos (say that after a few sherberts) to put the icing on the cake. It was also good to meet Martin from East Suffolk Lines Rail Partnership. Always good to put a face to a name, especially when they turn out to be a friendly, chatty face! Bet most of the pax don't realise how lucky they are! I think the next picture sums it all up. We are truly blessed to have this set in our area, and the memories of those of us of a certain vintage are triggered and re-triggered day after day. What a huge hole will be left when they are gone. Yes of course there's a video! Enjoy, and I look forward to all the comments rolling in! 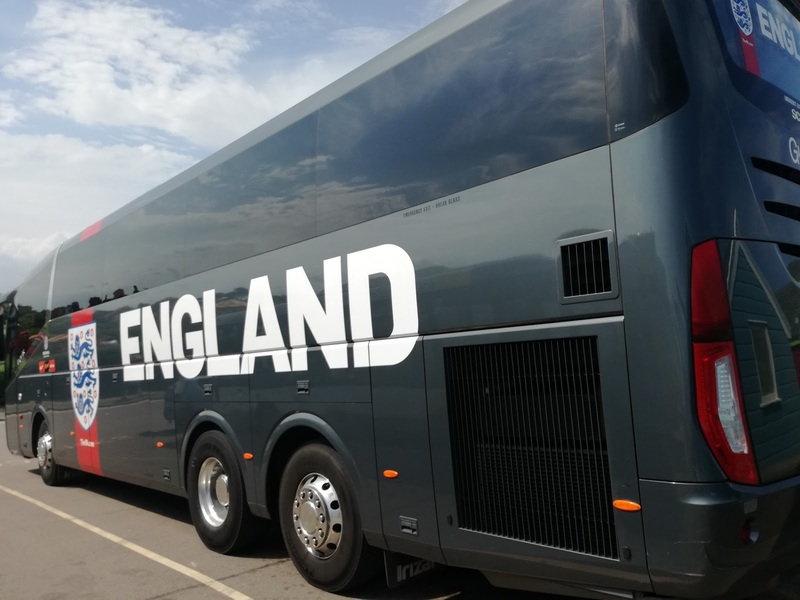 Well the England Football Team Coach anyway. 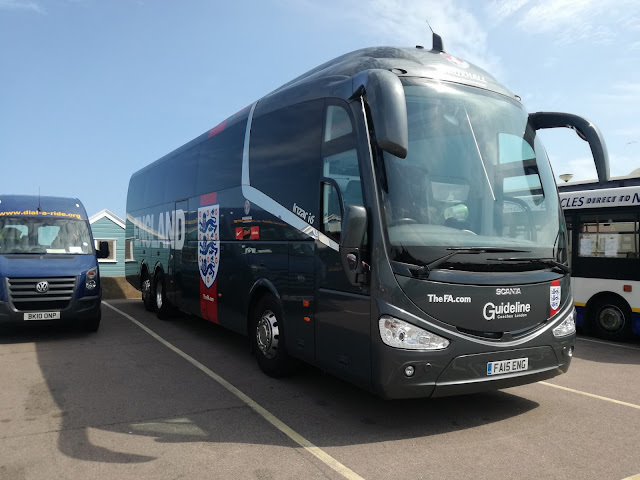 I was on my regular weekly trip to Southwold to meet up with a mate, and while I was there a huge grey Scania Iriza i6 arrived emblazoned with the 3 Lions badge and England. Can't be the real thing, I thought, looking at who was disembarking - if it was the England team it was the 1937 team with their WAGS! 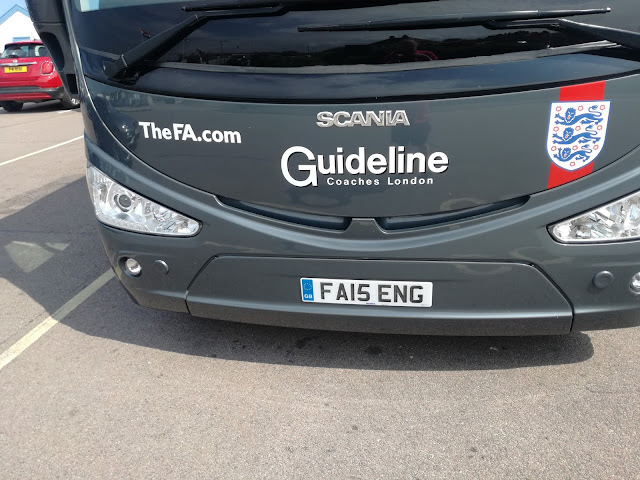 But a glance at the registration - FA15 ENG and a chat with the driver confirmed that yes, this was the real McCoy. Operated by Guideline Coaches of Chelsfield, near Orpington in Kent this coach isn't quite as flash inside as I expected. The driver explained the tables had been removed as England have so many backroom staff now it needs to be a 52 seater. The seats do look rather nice though it must be said! 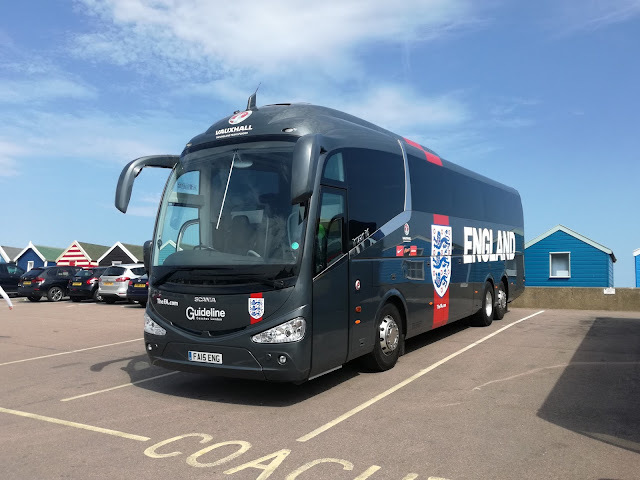 The coach's presence soon got around and many young boys, ok and dads, were soon streaming up to have selfies taken with this celebrity coach, the E200 I was on completely ignored for some strange reason. It was good to see a celebrity vehicle in the area, and many thanks to the friendly driver for letting me take a look. Here are a few more pictures. This is the traditionally quiet time of the year when not much happens, so there hasn't been anything worthy of a full post. So here are a few snippets of news. Firstly it looks as though a new round of bus cuts is on the way, which is most definitely not good news. 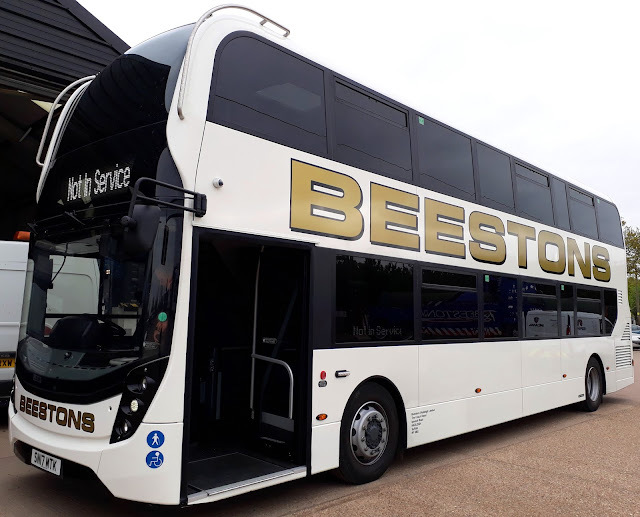 Beestons ae withdrawing the Sudbury - Great Cornard circular and reducing the frequency of their 91 Sudbury - Ipswich service, which I find astonishing as whenever I've used the 91 it's been very well patronised. 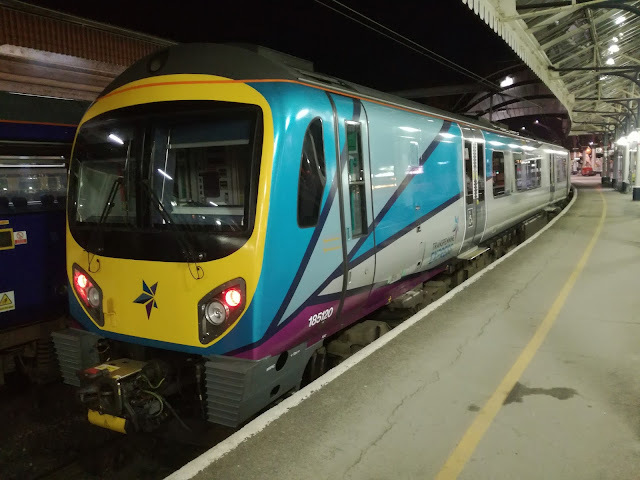 Sanders are also cancelling several services, although most seem to be Sheringham - Holt services, which will continue to be served by other services. The 33 North Walsham - Cromer will be operated by Our Hire, so I assume that is a tender changing hands. No details on either operator's website yet so I'll give more details when they are available. Speaking of Beestons they have got their new 86 seater ADL E400 MMC SN17 MTK out on the road. The bad news is it's for Two Sisters contract/private hire work only so trying it out will prove tricky. My thanks to Dave at Beestons, though, for sending me a pic of this, erm beest! Dave also informs me another one is expected early next year. First Ipswich buses are appearing everywhere, or should I say ex First Ipswich buses are appearing everywhere. Volvo B7rle 66850, which had been at Lowestoft has now had Network Norwich vinyls applied and is covering a poorly Streetlite on the Charcoal line 40 to Poringland. In the meantime sisters 66979/81 have been working in Yarmouth still with Ipswich vinyls, before apparently heading to Norwich to be painted into Red Line colours. I'm grateful to Cameron for sending me this pic of 66979 on the 1 to Lowestoft yesterday. Now something a little more serious. 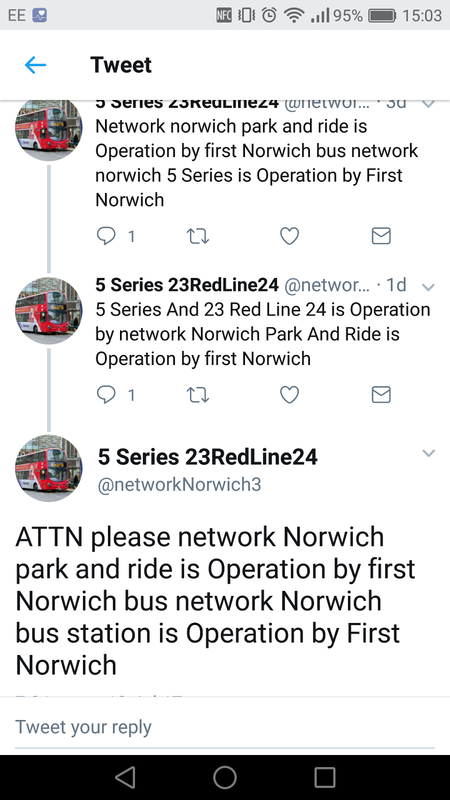 There is a rogue Twitter account spouting absolute bovine muck relating to First Norwich. 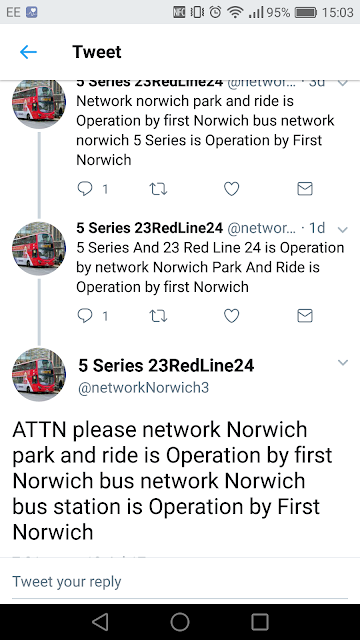 @NetworkNorwich3 is the account calling itself 5 Series 23RedLine24. Not only does it headline old news as current, but it also makes false claims about who operates what. Hee is an example. You can see how false and misleading this is. If anyone knows who is behind this account please let me know- anonymously if you like - so he/she can be stopped and dealt with. Thanks. 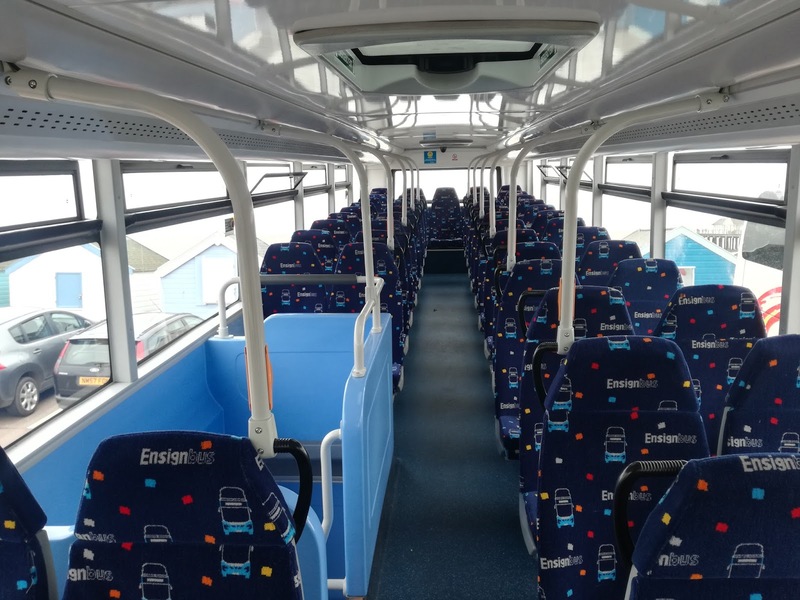 I managed a ride on one of Borderbus's newly acquired ex Stagecoach London Scania Omni Citi deckers last week. As I expected a decent ride, not many rattles, copious legroom upstairs but dear God the seats. I lasted half hour before my backside said enough. The sooner those seats are introduced to padding the better. Have to say though it did look good in Beccles. Now something I was hoping for but didn't think I'd see. 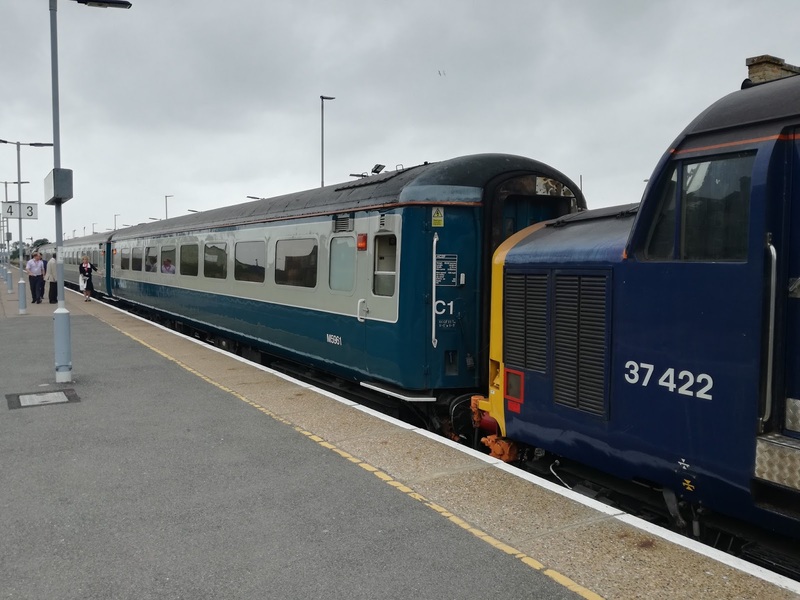 Due to recurring faults on the coaches on the Class 37 short set they are being replaced, temporarily I presume with 3 blue/grey coaches meaning that superb working museum piece will look utterly authentic. I understand the swap is taking place over the weekend so look out early next week for the first pics. Now all we need, if anyone in DRS happens to be reading this, are 2 large BR logo 37's to go on the set to really complete the look. Come on - it can be done! You will remember I had a pretty ghastly experience at Euston a few weeks ago courtesy of London Midland's non existent customer service. As promised I have been following up my complaint, and after a letter addressing the wrong complaint (they guessed) I finally got an email 3 weeks after sending in the complaint that they couldn't open the attachment so actually had no idea what the complaint was about. Negotiations are on going as they say but the way things are going I won't accept anything less than my own train!! It's a Go Ahead company btw. Which brings me nicely onto Anglian. 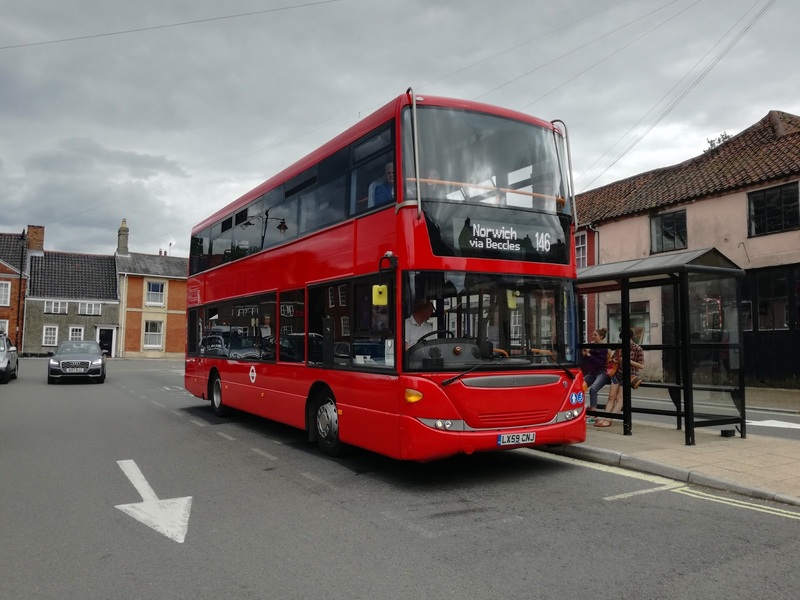 It has been decided to turn the Ellough site in Beccles into an out station, Go Ahead claiming that a PVR of 18 doesn't justify full depot status. 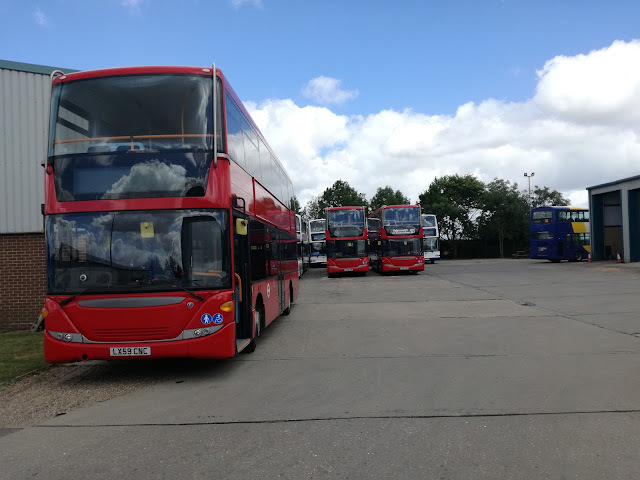 As I understand it the offices and workshops are being mothballed, all management and admin are relocating to eithe Dereham or Norwich, and only two leading drivers, cleaners and a portakabin will remain at Beccles. 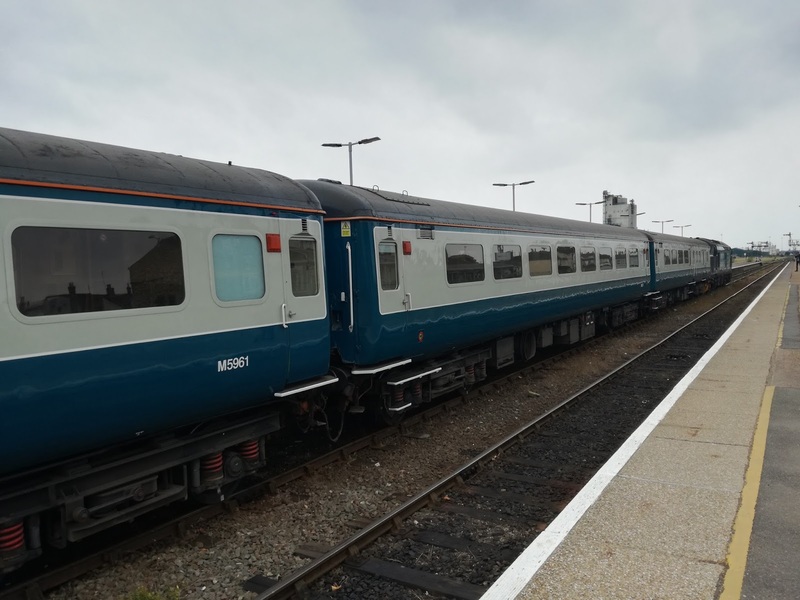 Money will be paid in at Norwich, though how the 60H/S/61 drives are meant to do that is anyone's guess, and if a bulb needs replacing for example a van will be based at Norwich to speed to te assistance. All other maintenance will be carried out at either Konect or Hedngham. The company insist, though that Anglian is not closing. Right that's it! See you soon. 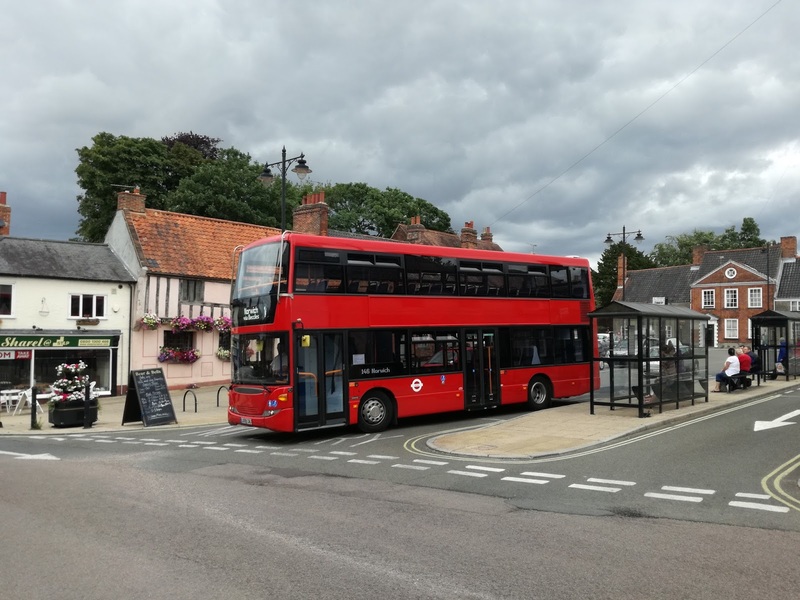 I have known for sometime that Borderbus were getting 3 ex Stagecoach London Scania Omni Citi deckers for their Beccles operation. I have known for an equally long tie that they were hoping to get 3 of them to help with Latitude duties this weekend. What nobody really knew was if the 3 permanent Scanias would also be the 3 Scanias used on Latitude. Today the trio arrived at Beccles, bizarrely displaying destinations for the 521. I popped up to the depot to find out what was going on. 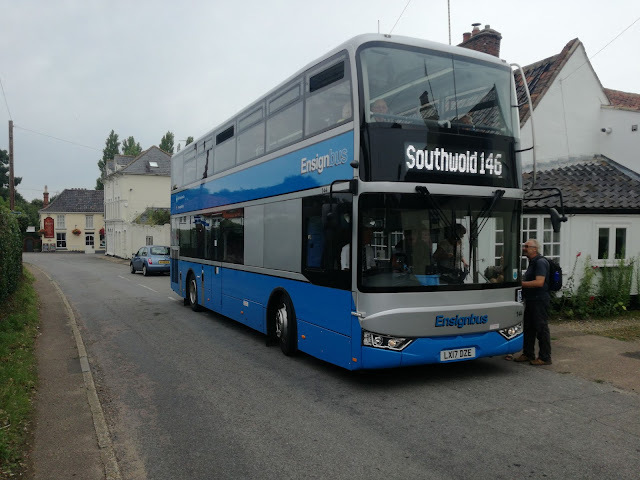 The 3 in question are LX59 CNC/E/J, formerly Stagecoach 15138/9/41. 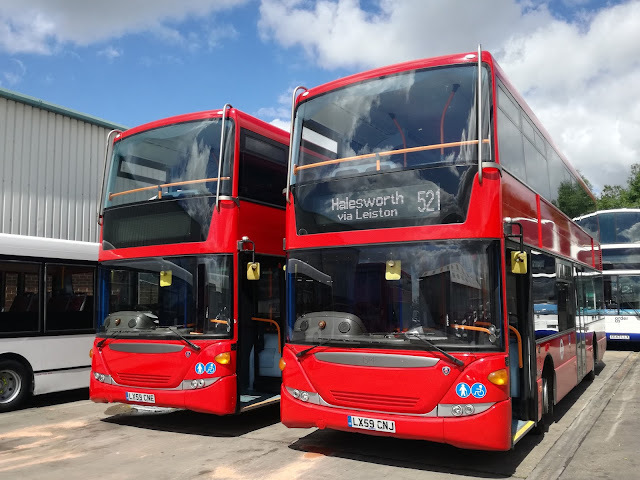 I can confirm they are the 3 purchased by Borderbus to replace the 3 Volvo B7tl Geminis. After latitude they will go, one at a time for conversion to one door and painting. The seats will be introduced to foam padding, 6 extra seats fitted downstairs but the top deck will remain the same, the cost of adding a row of seats rather expensive for what it would achieve. So the extensive legroom will stay. LX59 CNE/J, with one showing a destination never to be seen again! One of the Geminis has already departed. 210 LF52 ZPC has gone to Scania for resale. 209 will follow after the first conversion has returned, with 208 remaining until the last Scania has been converted, although it will revert to its original registration, with BB03 BUS being used elsewhere. 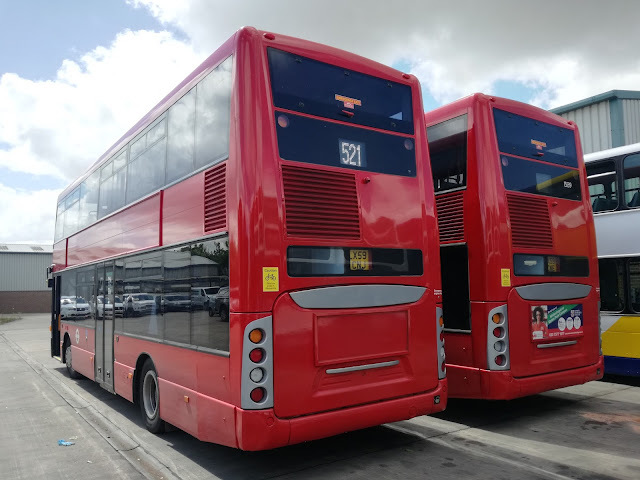 I must say te destination and number screens look good, although they will certainly look very different in Borde4bus colours. My thanks to Andrew and Dave for putting up with me in what I know is a very busy week for them, and I look forward to the first one coming back. In the meantime I'll be sampling one of them on Latitude's Southwold shuttle on Friday. You must have realised by now I am not one for static displays. I like motion, I like sound. If something has been designed to move with a recognisable sound I want to see and hear it. 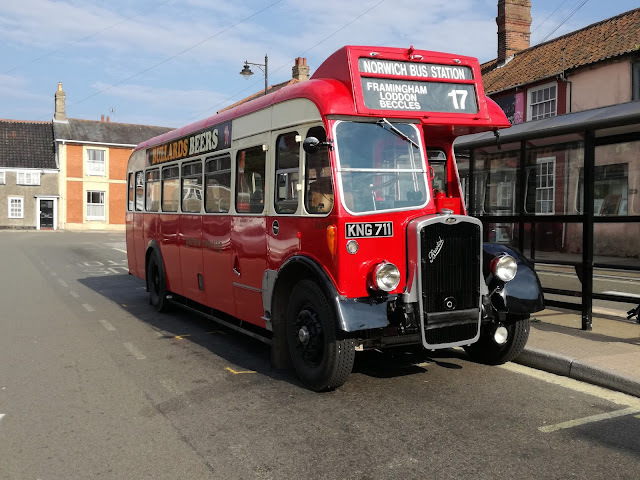 Therefore as I set out Sunday morning to meet up with Tim in Beccles before attending the 30th Anniversary of the closure of Eastern Coach Works Event at East Anglia Transport Museum in Carlton Colville, I was not in a particularly optimistic mood. I had seen a few pictures from the previous day and honestly believed I'd be there for a couple of hours, get bored silly, and be home by mid afternoon. How wrong I was, and I'm delighted to say this post will be much, much longer than I anticipated. I don't attend these events for the buses. I attend them to meet up with friends, to see people I only see at these events, and to have a good gossip. However, on this occasion the buses were important. I grew up with Bristols, Bristols and yet more Bristols. I have driven Bristols, ridden Bristols, been taken to school on Bristols, chatted to driver mates on Bristols, and they were as ubiquitous in my life then as Geminis or E400's are today. And all were bodied by the good folk in Lowestoft, at the Eastern Coach Works. 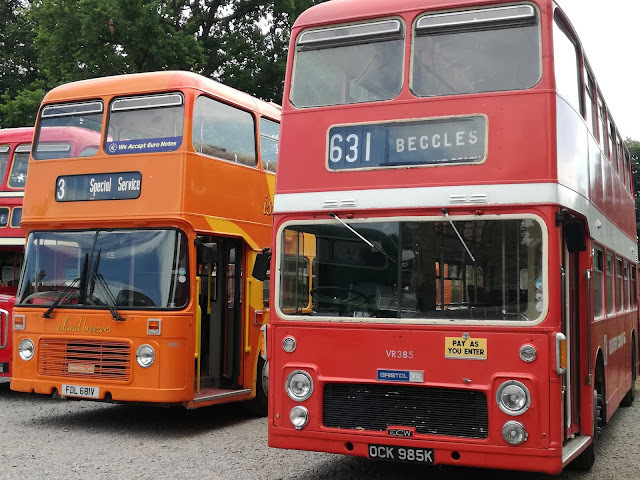 Of course they were bodying buses long before the VR came along, but it is the Bristol VR I associate ECW with the most, and the Bristol VR I wanted to see, and more importantly ride at the event. 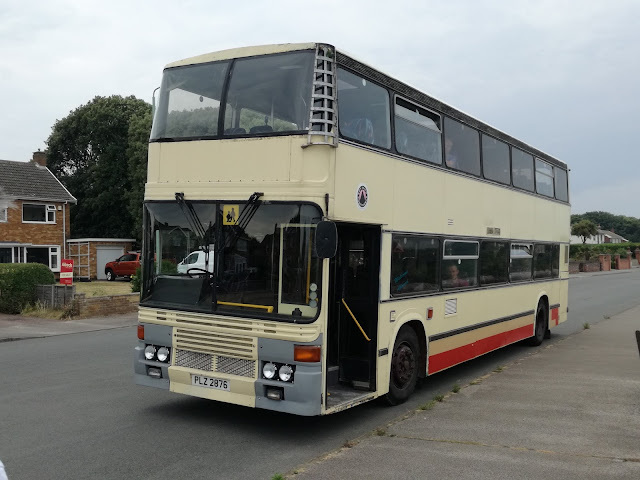 It seems the bus Gods were hearing me as round the corner on the free shuttle to the museum came Bristol VR OCK 985K, new to Ribble in 1972 before transferring to Eastern Counties in 1985. 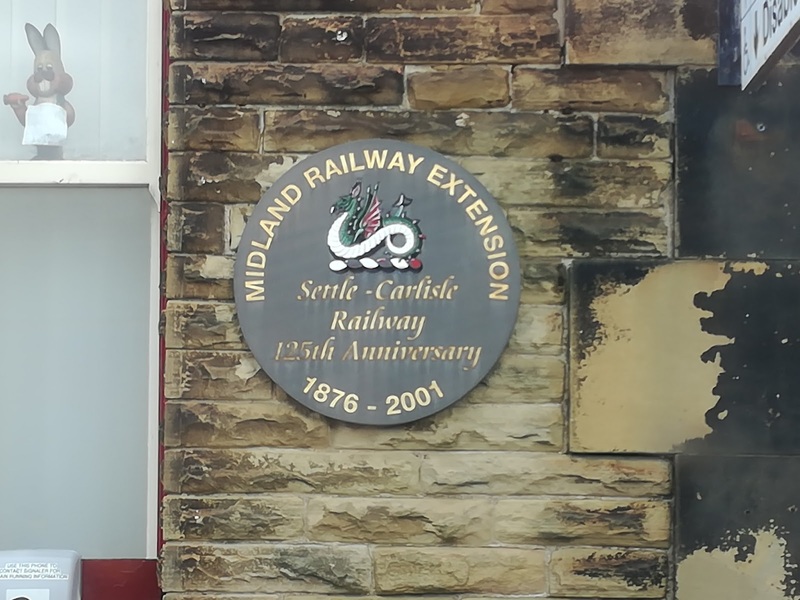 In 1996 it was withdrawn after 24 years in service and acquired by the Transport Museum. I actually like the fact it isn't in pristine condition - it looks like it did when it finsihed service and that's good as it is how they looked when I was catching them. It makes a change from something you are afraid to breathe too heavily on. No rattles, a lovely growly Gardner engine, and it did not feel 45 years old. In fact it felt a darn sight better than most new buses on the road today. We got to the museum and just took in the atmosphere, chatting to Andy and Richard on the gate, and admiring the impressive number of people attending the event. 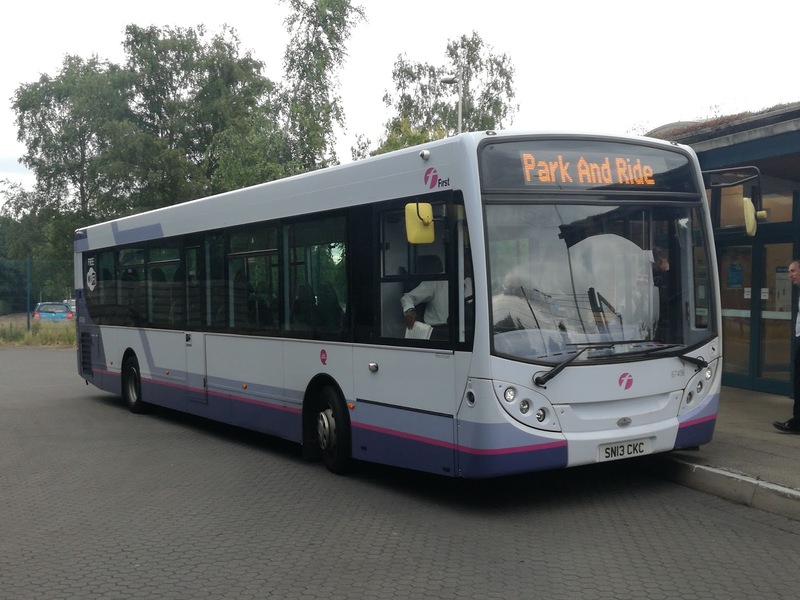 Many of them arrived on the Park & Ride service, operated by First, and with the most appropriate bus in the fleet. Andy Swan swears this was his idea so I'm giving him the credit. Volvo B9tl 37572 AU58 ECW was used, and I thought that was a great idea which added a nice touch to proceedings. Our next ride was on a visitor from Yorkshire. 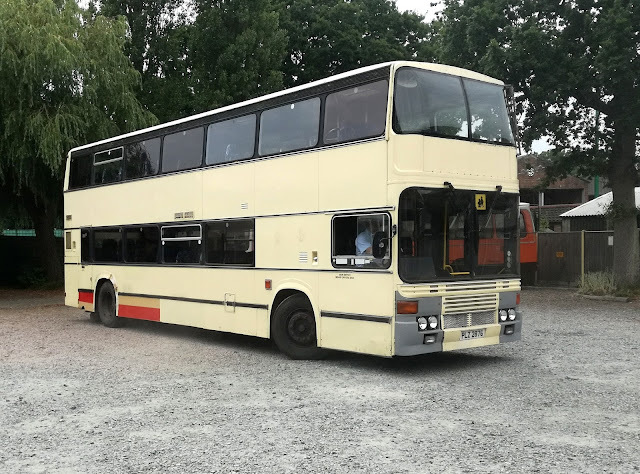 Bristol Lodekka NWU 265D. Built in 1966 it served the good public of Yorkshire before becoming a training vehicle and finally preserved in 1990. Again a really nice journey, and I began to appreciate just how good the body builders of Lowestoft were. We left the Lodekka there to get a spot of lunch, which proved a wise decision as sadly the Lodekka broke down on the way back to the museum. It proved to be an even better decision as something rather special came round the corner to take us back to the museum after lunch. 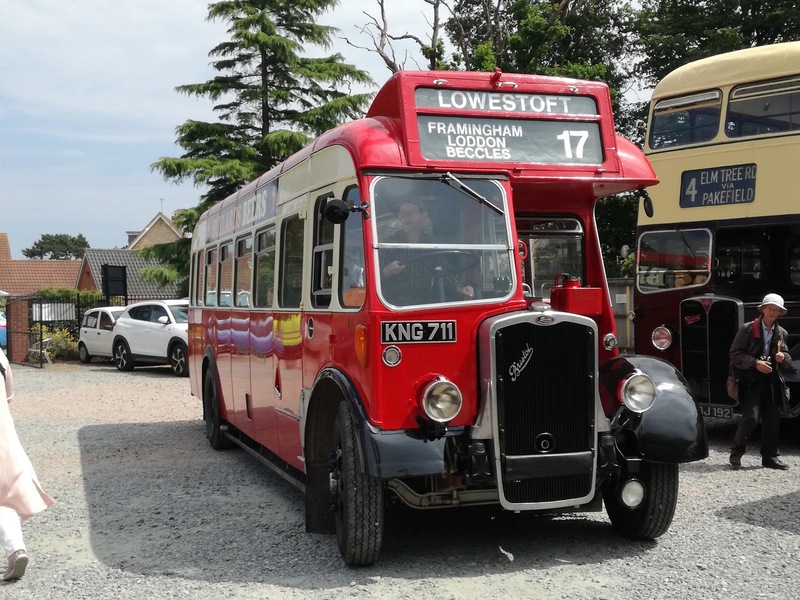 KNG 711 is a 1960 Bristol L5G, new to Eastern Counties as LL 711. I'm not normally that enthusiastic over anything that predates my memories but there are exceptions to everything and this is one. You could actually feel as though you were in the 1950's on this rickety little 35 seater. 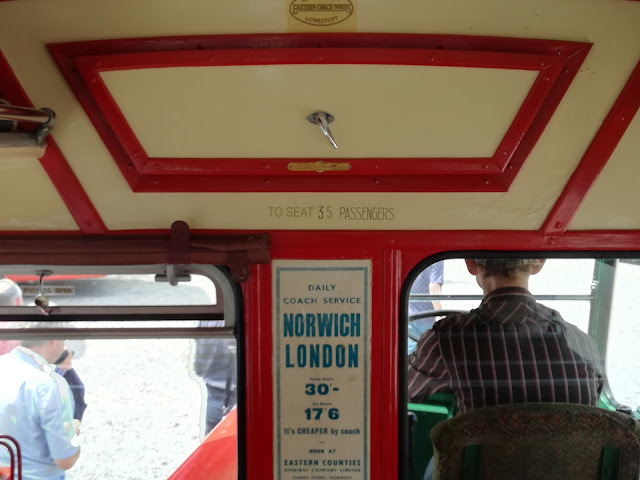 Displayed at the front was a poster advertising a daily coach service to London at the price of 17 shillings and sixpence for a day return. I'm guessing you didn't get much time in London. 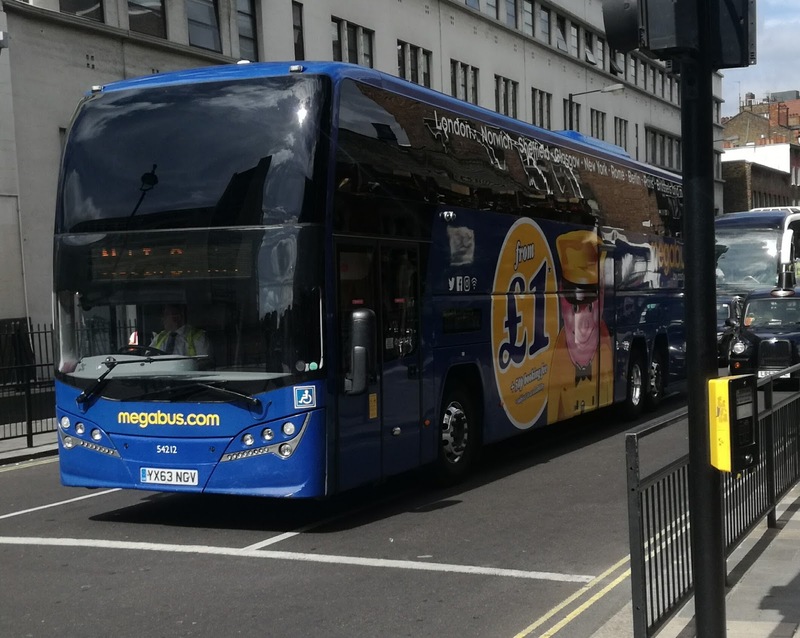 Book early on Megabus and it doesn't cost much more than that these days! Another trip round Lowestoft on the earlier VR in the company of Norwich Buses Blog supremo Sam Larke, and the ever pleasant Jamie Glasspoole, and things really looked up. 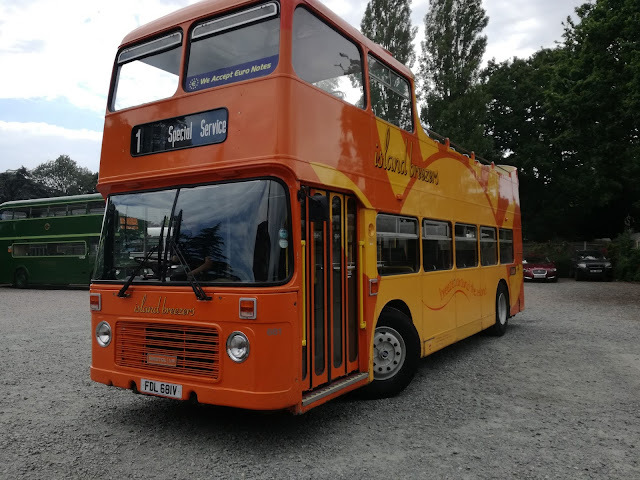 Another long distance visitor was open top former Southern Vectis Bristol VR, FDL 681V, looking superb in its Island Breezers livery. 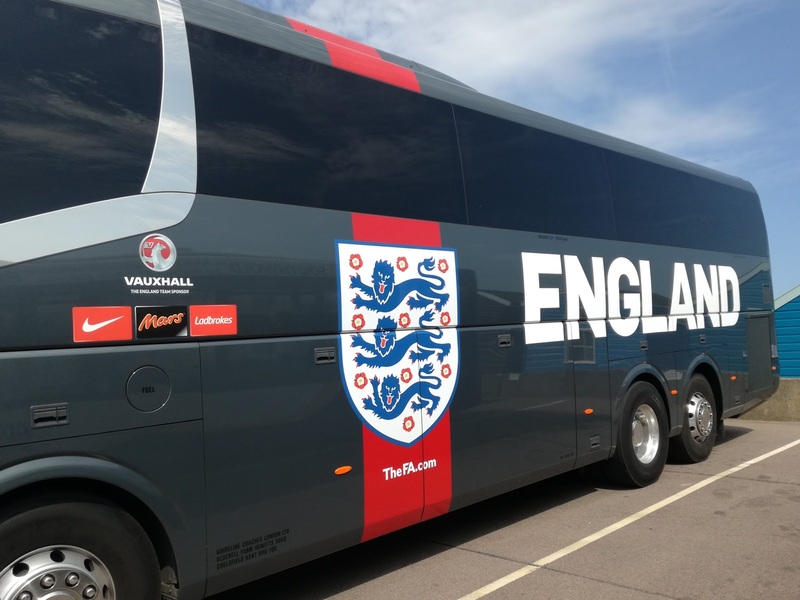 This bus is in superb condition. The only noise to be heard was the iconic engine (and nearside front spring according to the pleasant young driver). Open top buses are always pretty cool anyway but when it evokes such memories too it's a double bonus. Oh - I was right - those staircases were a lot easier than modern ones. No idea why but they were! It was a very enjoyable half hour. When we got back to the museum the driver conveniently parked next to the other VR, making a fine pair of Bristols! A fine pair of Bristols, Matron! That was the major box ticked for the day. However a bonus that not even Brucie could have thought up was in store. 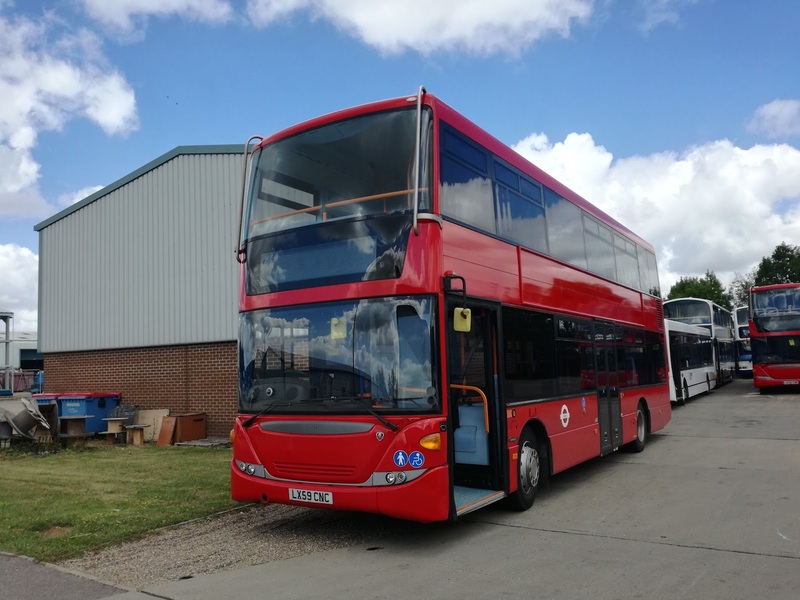 A replacement was needed for the stricken Lodekka,, and what a replacement we got. New to Eastern National as D510 PPU this ECW Olympian coach has certainly done the rounds, seeing service with Sanders, Lodges of High Easter, Essex, Flagfinders of Essex where it was re-registered PLZ 2876, It then moved onto Tony Glew in Colchester before spending the last few years at Venturer Coachways in Brightwell. With Venturer's demise earlier this year this magnificent bus is now at Our Hire of Acle. 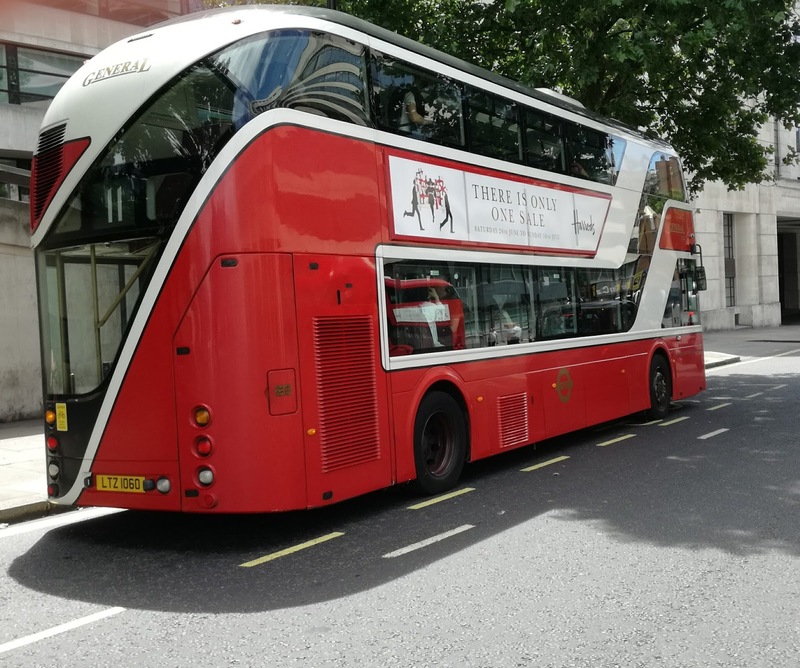 This is one of only three full length, low height Olympian coaches built for the UK market with this body, and is strikingly different to the Olympian coaches I knew on Maidstone & District. What isn't different, though, is the quality. 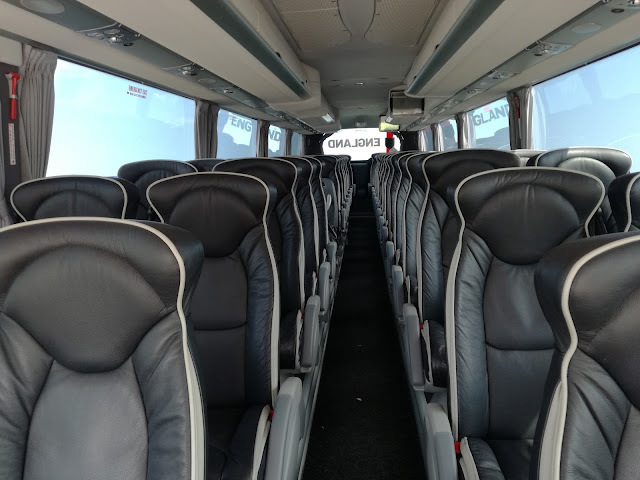 The seats are sumptuous and comfortable, and even now it has the feeling of something special about it. It's quiet, non rattly and powerful. Tyson Dundas, of Our Hire, who was driving told me when I asked him if he was going to preserve the coach, that he's intending to use it! So the working life carries on 31 years on! Tyson has also agreed to let me do a special feature on this bus, so look out for that in the coming weeks. It was just a joy to ride it, not, I sincerely hope, for the last time. 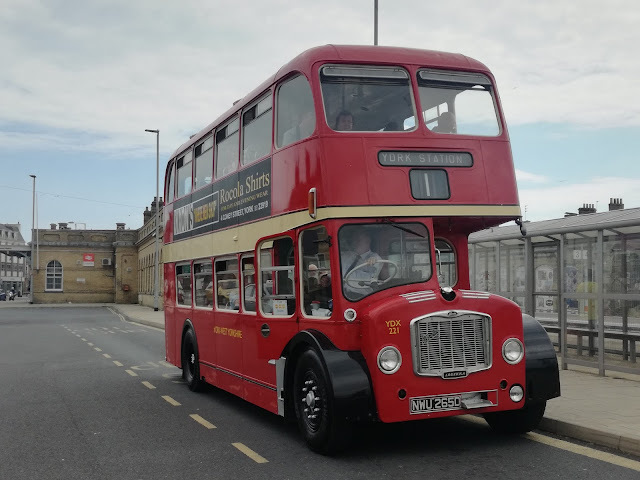 It's completely wasted on kids, and how ironic that when First are struggling to find a new bus for the X1 we have here a vehicle that would have suited it to the ground 30 years ago. And that was about it. 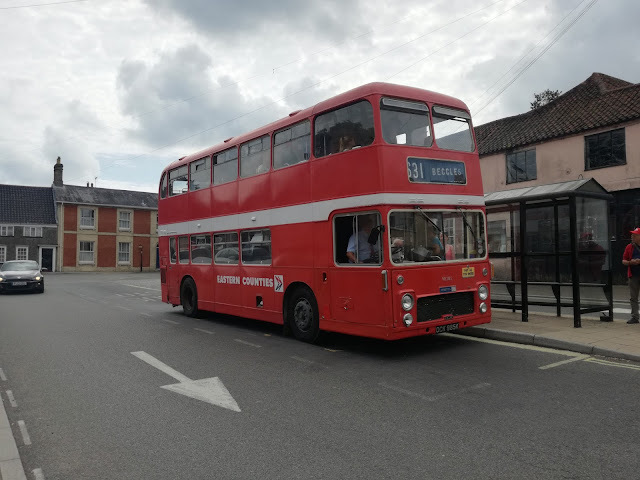 A return to Beccles on the adorable Bristol L5G, which cruised along the A146 at 45mph, and a highly enjoyable day was completed, with just one little blot on the landscape. Where are the other buses that attended I hear you ask. They were on the back field, behind the museum and there were about 15 of them I'm told, although at least 5 of them made an appearance doing runs. It would have cost 9 quid to see them. EATM's brains decided they would be an added extra to their normal tram/trolleybus attractions. I've done them. Great for kids, not fantastic for 51yo's. Why on earth wasn't there a "ground" ticket for the day? I am not going to pay 9 quid to see 15 buses when it only costs a tenner to get into Showbus and around 600 buses! That was a bad move by the committee and I hope they review this for future events. I've heard insurance issues mooted but don't believe that for a second. Many attractions have different price scales depending what you want to do and I'd have happily paid 3 or 4 pound to get access to the buses, cafe, loos etc. That excepted it was a great day, well attended, vehicles I wasn't expecting to see (and some I was which had nothing whatsoever to do with ECW) and some great chats. My thanks to Tim, Sam, Jamie, Andy, Richard, Thomas, Colin and anyone I may have missed. See you all at Norwich in August. 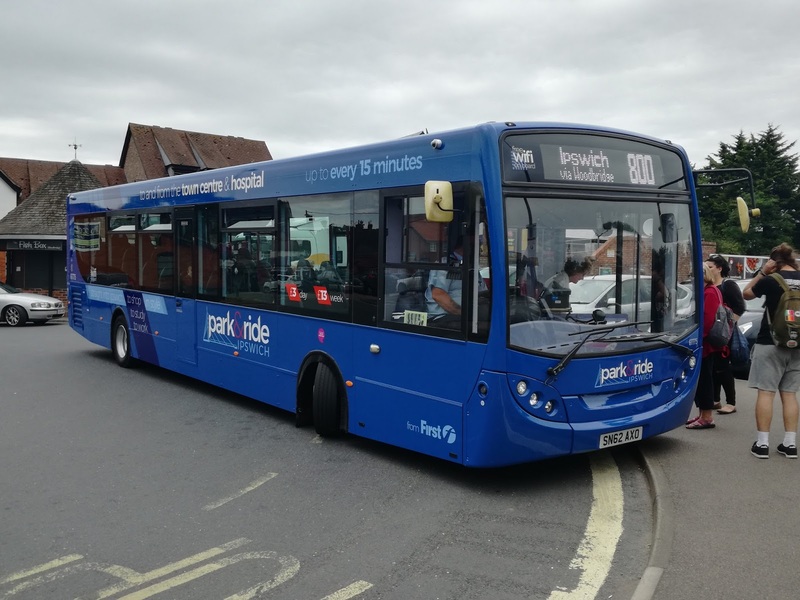 Today saw First Eastern Counties take over Ipswich Park & Ride services from Ipswich Buses. A new timetable, extended route to Rendlesham, and a fleet of 5yo Enviro 3oo's painted in Ipswich Town Blue. I understand Ipswich was a hive of photographers so I didn't go there. I went to the P&R side at Martlesham where a group of First managers were overseeing the first day, and wondering where all the buses had got to. A big gap had appeared and no one knew why. Body armour was needed as passengers were not keeping opinions to themselves, and I felt quite sorry for the managers who had no influence or control over the situation, but had to field the questions and comments as best they could. 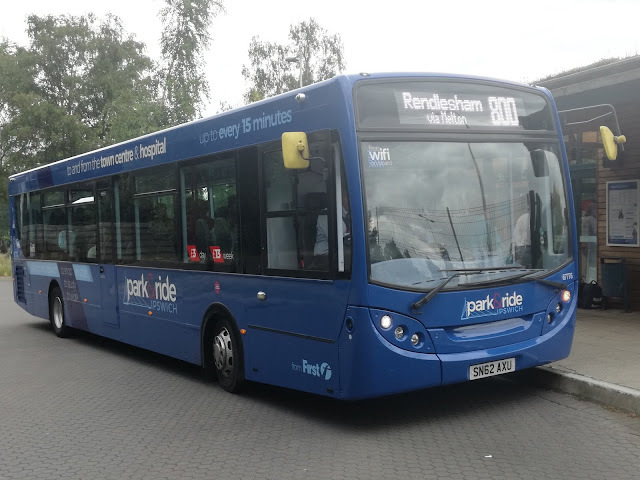 Very soon a Rendlesham bound bus arrived, disgorging some very unhappy bunnies, who again took it out on the managers who still didn't know what had caused all the delays. This time it was 67776 SN62 AXU, which I was to ride later. 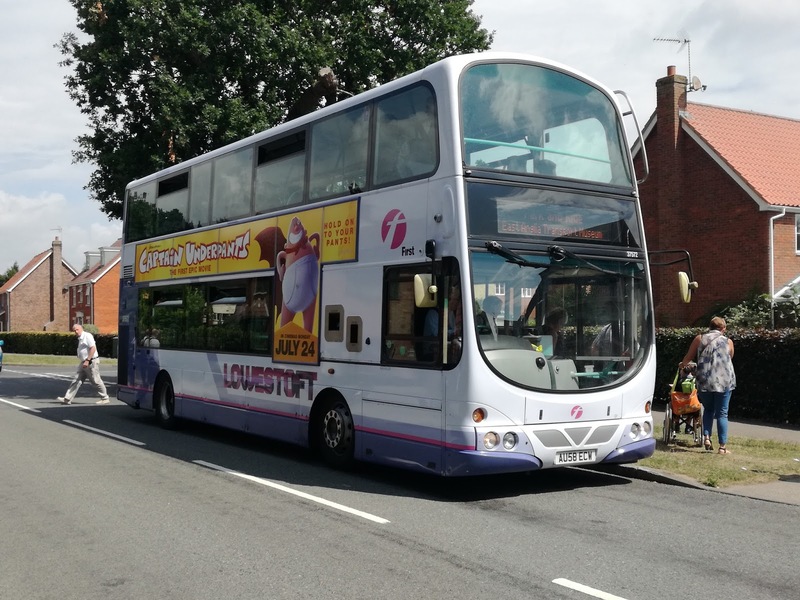 Next up was the latest addition to the Ipswich fleet, 67406 SN13 CKC which only arrived from Bolton last week in exchange for Volvo B7rle 66983. 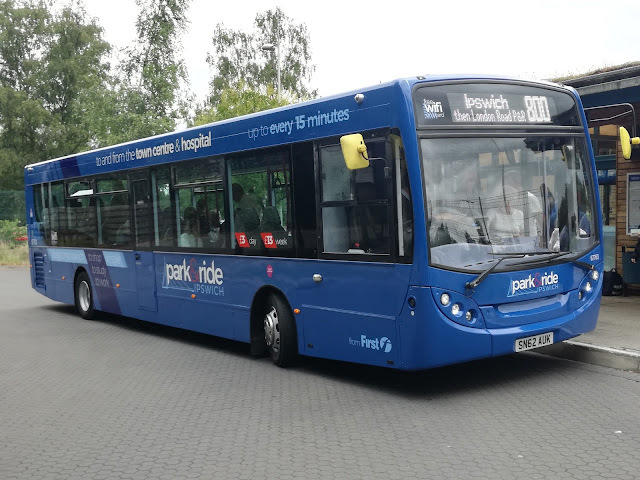 It will eventually and up with a blue front but will be used on all routes if the rest of the P&R fleet is on the road. It still awaits its new destination screen. No sooner had tat departed than my next E300 arrived. 67775 SN62 AXO was the vehicle and I have to say this bus is lovely. No unnatural rattles and goes like the clappers! A thoroughly enjoyable round trip via Rendlesham to Woodbridge, and a decent friendly driver too. 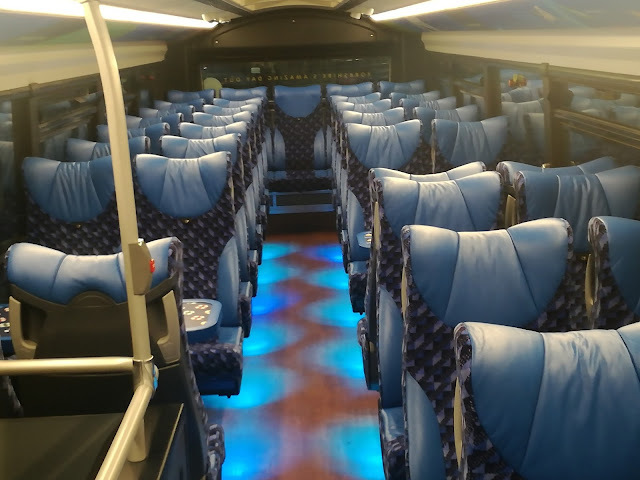 This is the standard the other buses should be. It was at Woodbridge I noticed what was advertised on the side of the buses. 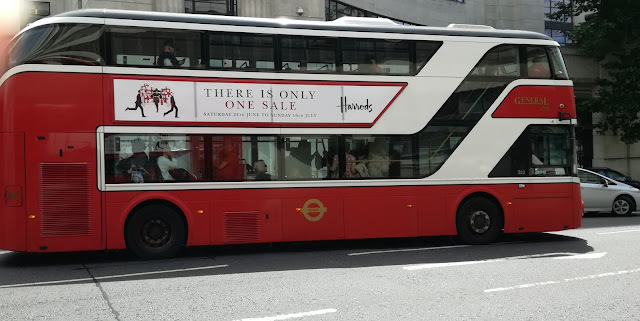 Now I have been known to comment on the ride quality of buses starting with E, indeed have described my insides being re-arranged on some, so I think this is extremely appropriate advertising, even if on a bus that gave a relatively decent ride. Soon my final P&R bus of the day came in. 67773 SN62 AXH. This was between the other two in terms of quality, not as rattly as 67776 but not as quiet as 67775. This also needs tightening up in places but I'm sure Barry and his team will sort them out in time as they get to know the buses. 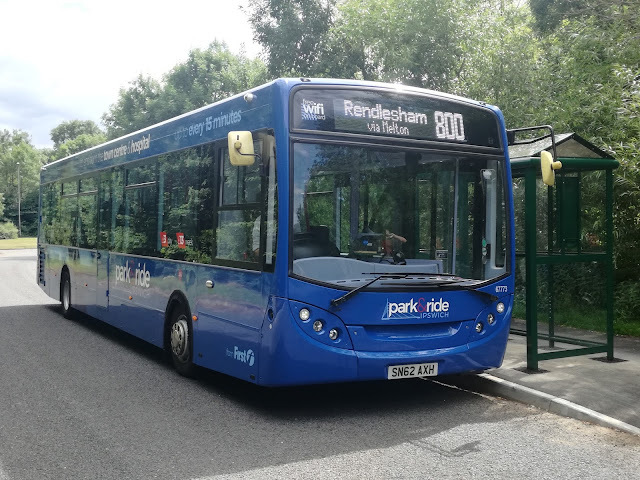 Another friendly driver who was happy for me to take a pic at the Rendlesham terminus - a location I'm willing to bet no one else bothered to go to today. 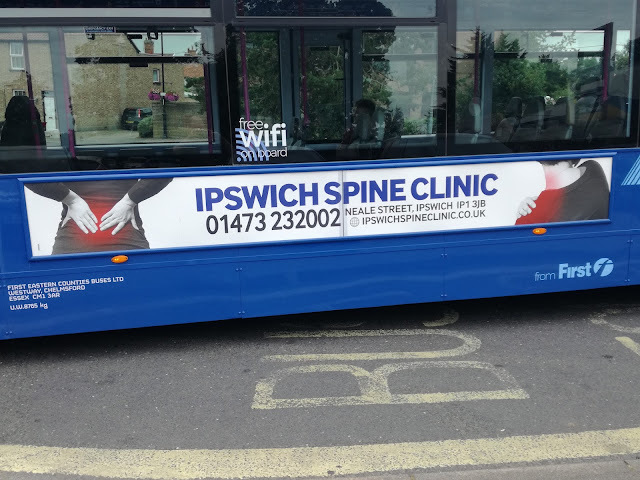 There are always teething troubles with a new service, and today was no exception, but I have confidence the service will settle down if the constant Ipswich roadworks let it. One problem I do see is the Rendlesham extension. If a bus is late out there it will be late back, causing a kink in the system. Some thought needed to overcome that from the team methinks, but on the whole a thumbs up. Those E300's are much nicer than the Versas they replace anyway. 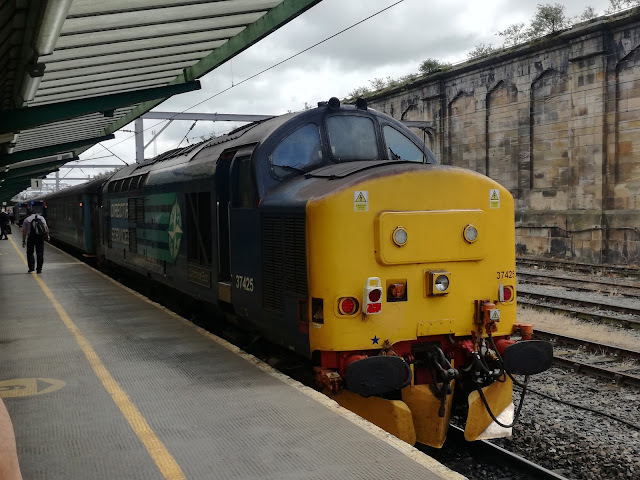 We left my trip oop North rather differently in the Gents loos at Carlisle station, having survived the night thanks to the decent night team there. At 0500 exactly the ticket office opened and I purchased my Round Robin Day Ranger which gave me freedom of the WCML and Cumbrian coast line between Carlisle and Lancaster. So over to Platform 1 where my accommodation for the next few hours was waiting. We are spoiled here in East Anglia with our short sets. 6 days a week we can travel on the main line behind a snarling Class 37 and almost take it for granted. The only other line in the country to have 37's is the Cumbrian coast line from Carlisle to Preston via Barrow in Furness. Unlike Norfolk there is only one loco, not two, but the route is considerably longer. Norwich to Lowestoft takes around 45 mins. 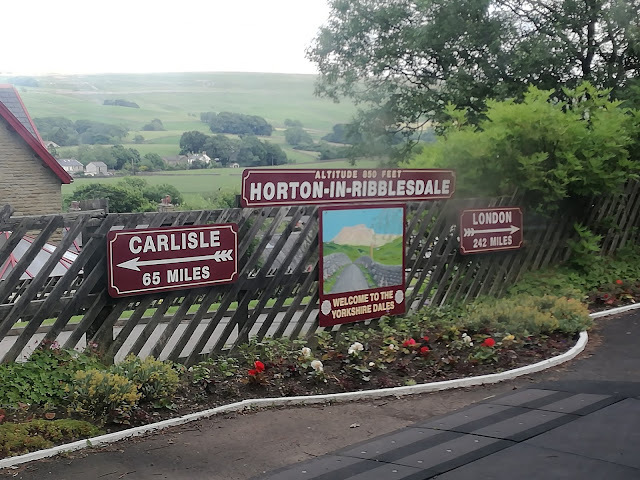 Carlisle to Preston via the Cumbrian coast takes 4h47m, so you can get a really big shot of the 37 drug. Oh and a small matter of 35 stops if all request stations are called at, and the vast majority were - I think. I say I think as it soon became clear that the weather wasn't playing ball and the Cumbrian coast was shrouded in mist meaning there was little of the promised spectacular views to be seen. So I allowed the gentle rocking of the comfortable Mark II coaches and throb of the 37 to lull me to sleep, and sleep I did. I always sleep with music on anyway and a 37 provides one of the best soundtracks possible! I was vaguely aware of the train getting very busy as we approached Sellafield, and again Barrow, which was good to see. 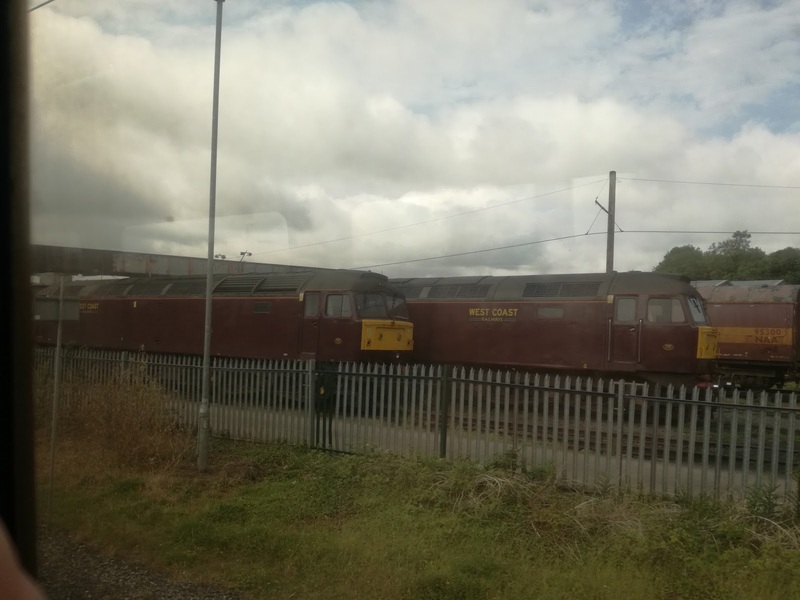 I got off at Lancaster, had a chat with the driver who confirmed the 37's are allowed a top speed of 80mph now, which we don't get in Norfolk, and got the mother of all videos of the set pulling out towards Preston, which will be included in the compilation of videos I'll post at the end of this series. I left Lancaster station in search of some breakfast and immediately came across a very small sandwich bar, and again was privileged to be treated to the amazing Northern friendliness. The lady in the sandwich bar greeted me like a life long friend, then when I told her what my plans for the day were promptly got her tablet out and checked the weather forecast for me, insisting it would soon cheer up and the rest of the day would be fine. When you're traveling alone it's things like that which make all the difference. I shall return! She was also right. 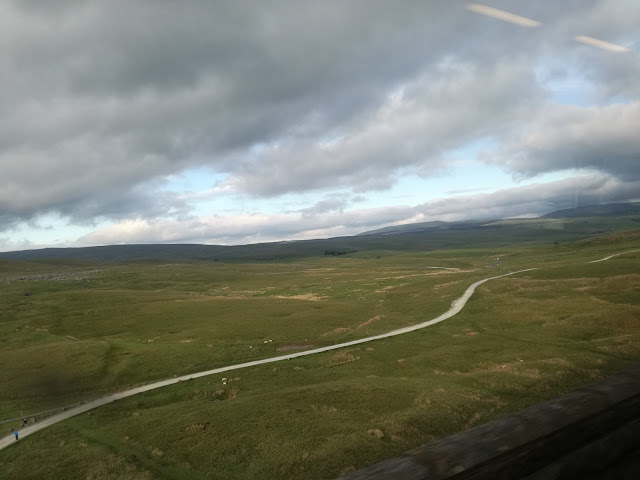 As we pulled out of Lancaster on the return journey things indeed started to cheer up and I realised I'd get to see what the mist had covered on the way out. 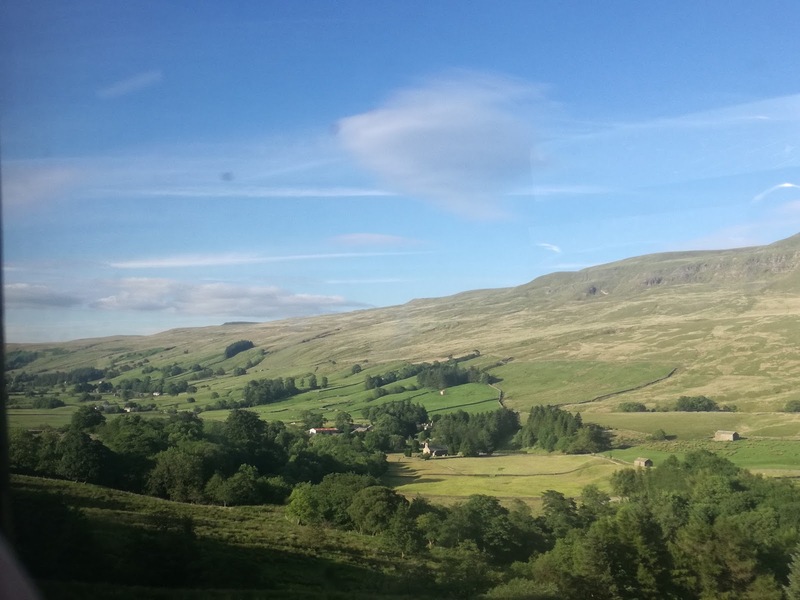 The line also passes West Coast Rail's depot at Carnforth so you get views like this too! 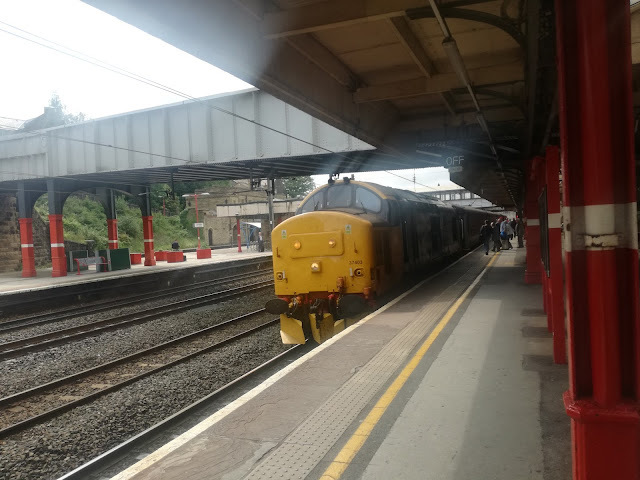 We had a very rushed scramble to change trains at Barrow, where the other hauled set was waiting, this time with "Angry Bob" 37425 at the head. 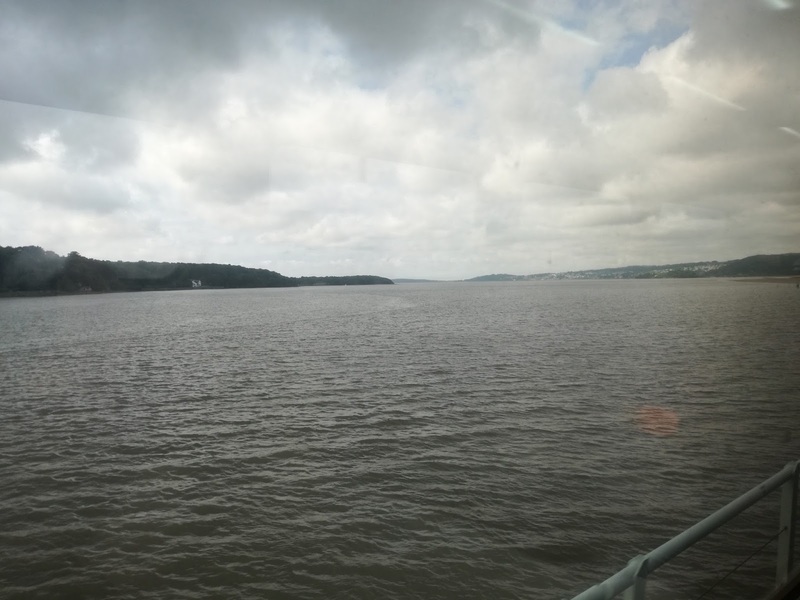 I was the wrong side of the train for the more scenic shots, and in all honesty I know some think that line better than Dawlish and the South Devon section of the GWR but I disagree. 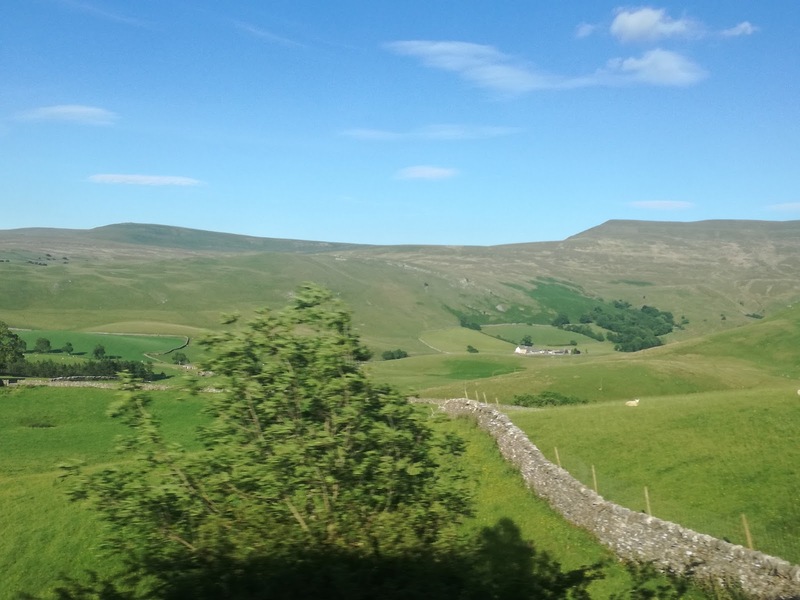 I would happily spend the rest of time behind a 37 on the Cumbrian line, but only for the 37. It's a really lovely line but it's not Devon. Some serious phone charging was now needed so I decided another trip to Lancaster and back was in order, this time on the main line. A second Pendolino confirmed that they truly go like the clappers and the tilting is great, but again wouldn't be pleasant when full, and a Voyager back, which has power points at every seat so actually more convenient for my needs. They don't hang around either! Back at Carlisle for tea, then it was time to head to platform 6 for the journey I had waited for many years to do. 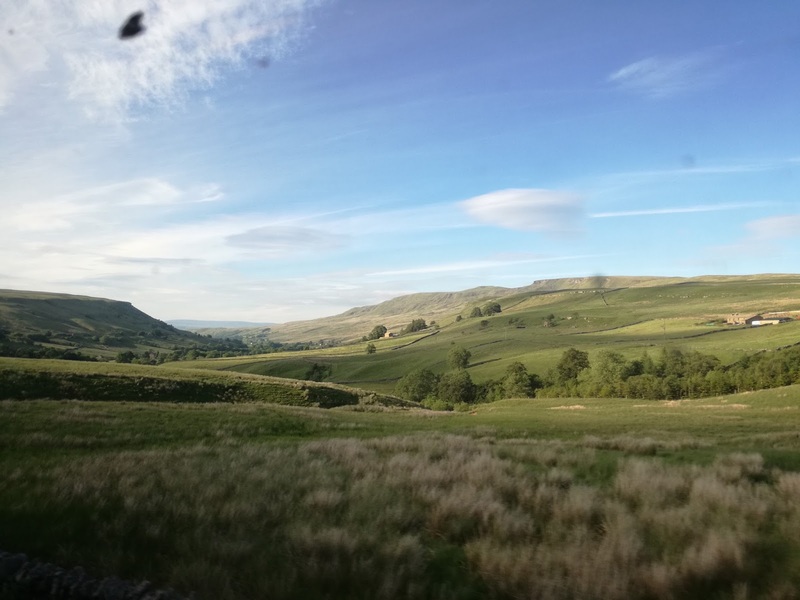 The Settle & Carlisle line to Leeds. The tiredness was really creeping up on me now and the 158 was one of the hottest trains I'd been on, so staying awake for the first part of the journey was a problem. it was also annoying as obviously this is one trip I didn't want to sleep through. 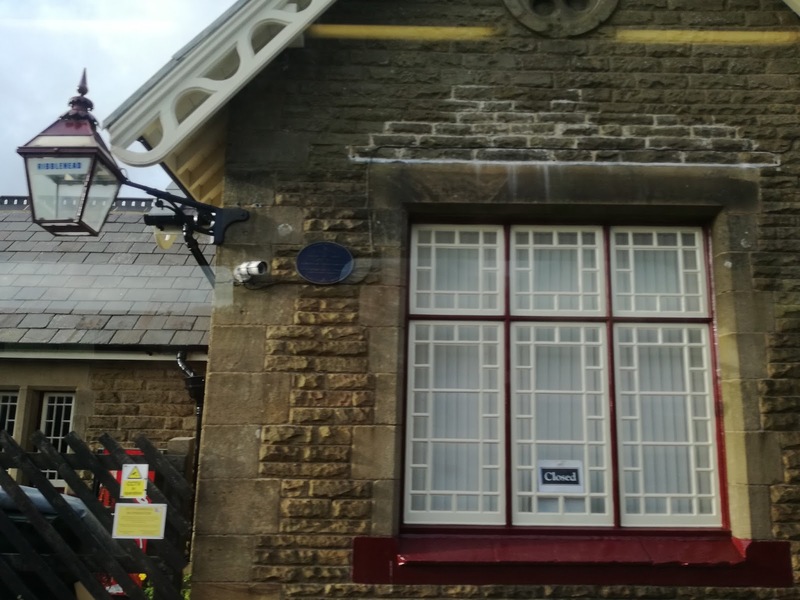 However at Kirkby Stephen I was jolted awake and realised this was the part of the line to stay awake for. What had been England's green and pleasant land turned into England's green and stunning land, as we weaved our way through the Yorkshire Dales. Camera glued to the window. 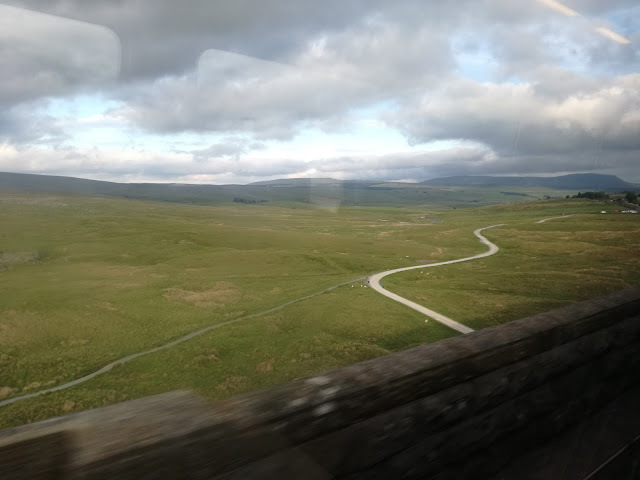 And then it was over the famous Ribblehead Viaduct, where I have watched countless trains pass over thanks to Railcam. 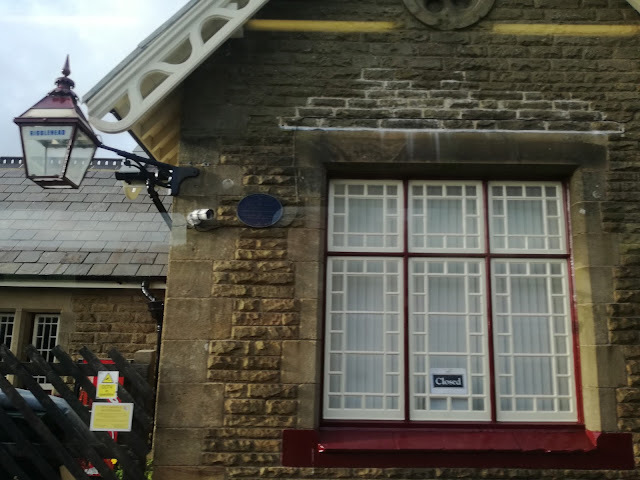 If you have ever watched Railcam's Ribblehead Station camera here it is, a little device bringing great pleasure to many. Then on to Horton in Ribblesdale and Settle. 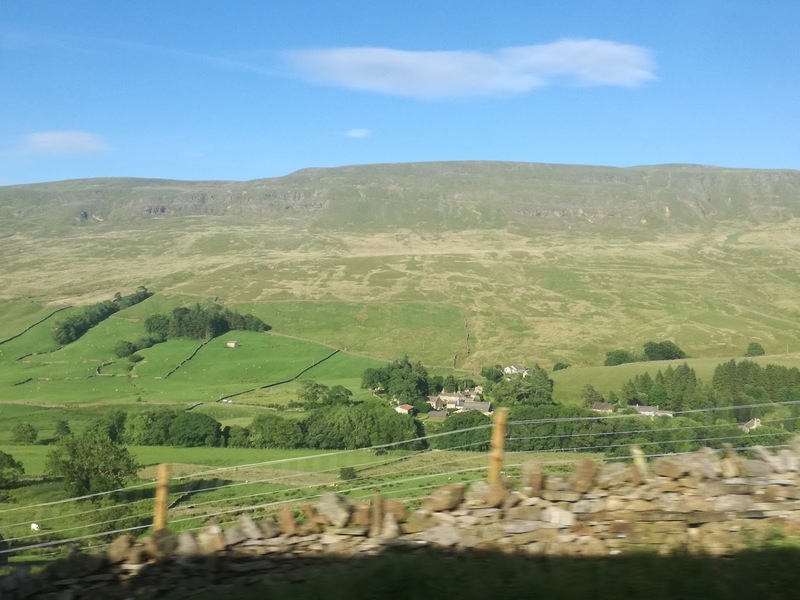 After Settle the landscape levels out and it's a fairly straightforward run into Leeds. This is a truly spectacular line, and lived up to expectation. I'm so pleased it was saved from closure in the 80's but I do have a couple of suggestions. Firstly £30 for a Day Ranger ticket on the line is a bit pricey and £90 for a family of 4 for a day has got to be very off putting. Lower the price, do a decent family deal and you will have them flocking. Include a hauled service and you would need extra capacity on the line. There is huge potential for added use of this line but not too much going on to tap into that potential. Secondly, particularly in the Summer run trains a little later. The 1814 was the last service from Carlisle and that really is a tad early. My own verdict is going to be controversial. I would do the S&C again in a heartbeat, I truly would, but I'd walk over hot coals to do the Kyle - Inverness line. The views on the S&C are wonderful, brought a fixed smile to my tired face, but not the wow factor the Kyle line has. Then there's the terminii. Leeds is ok, but it's not Kyle with it's mountains, Skye Bridge and seals. So I'm sorry but given the choice the Kyle line gets my vote. 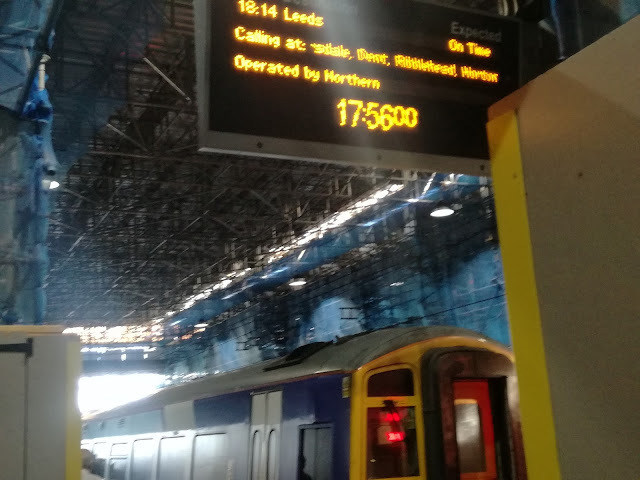 I arrived at Leeds roughly 9 hours before my coach to London left, with one more thing to do. 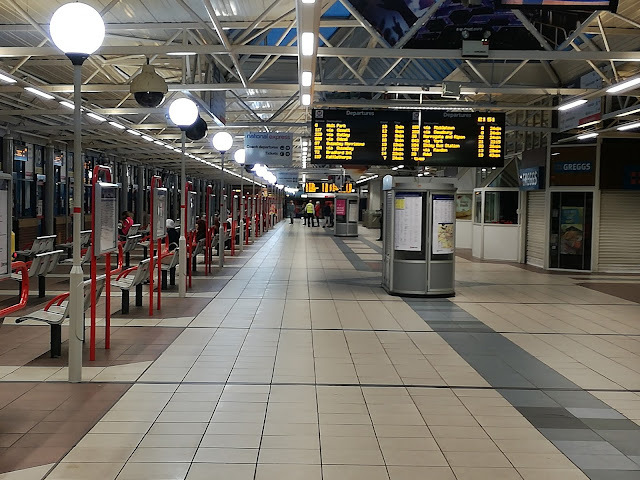 I was catching the bus to York, staying there a few hours before returning to Leeds by train, so it was time to find the coach station. A couple of friendly BTP officers gave me perfect directions to Leeds coach station, which is on the large side! 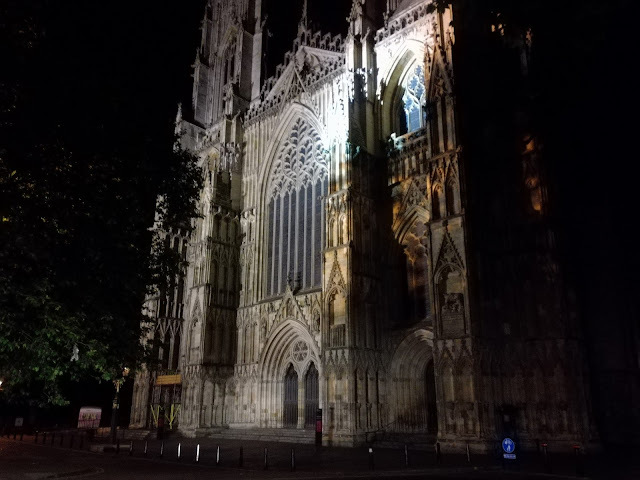 After the best chicken kebab I have ever had I caught the Yorkshire Coastliner service to York. My chariot was a Volvo B5tl on a Wright Gemini3 body. The interior was spectacular - here is the top deck. The B5tl is very powerful, great acceleration, and that interior, complete with phone chargers is sublime. But the body is still the weak link. A very hard ride making typing on the phone next to impossible, and rattles that just shouldn't be there. A shame as that interior deserves better - much better. An hour later and I was at York Station for the first time in 40 years. It turns out I didn't need to see anyone as the station is open all night anyway due to the Trans Pennine services to and from Manchester Airport. 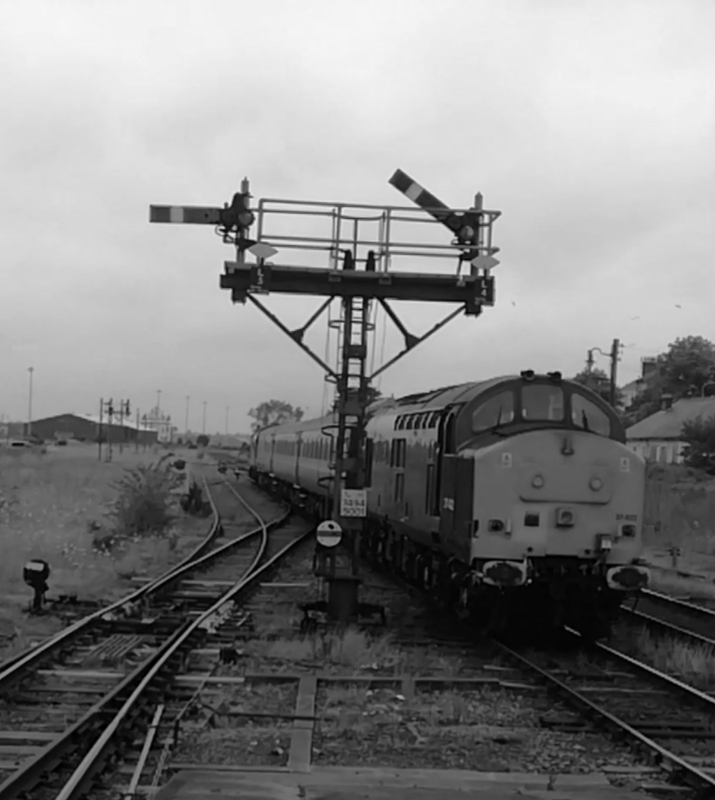 And not as entertaining as Carlisle as the freight uses the avoiding lines so not much to see. 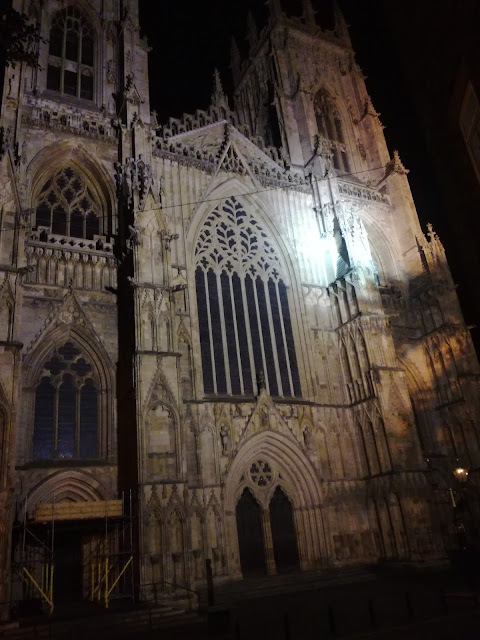 No open loos either so I wandered into the City, found a 24hr McDonald's, refuelled, and ended up taking pics of York Minster at 1am, as you do! Back at the station it was just a time killing exercise until my 0400 train back to Leeds. A Trans Pennine Class 185 which left me rather underwhelmed. Not the best seats, no charging points, harsh lighting. but it did the job and I was back in Leeds. I boarded the magnificent Megabus Volvo B11R at Leeds, closed my eyes and in seconds was in London again. I have never had a shorter coach journey! A stroll through St James Park to Whitehall, an 11 back to the coach station, and one last pleasantry on this mammoth trip, as Heritage liveried L60 pulled up. 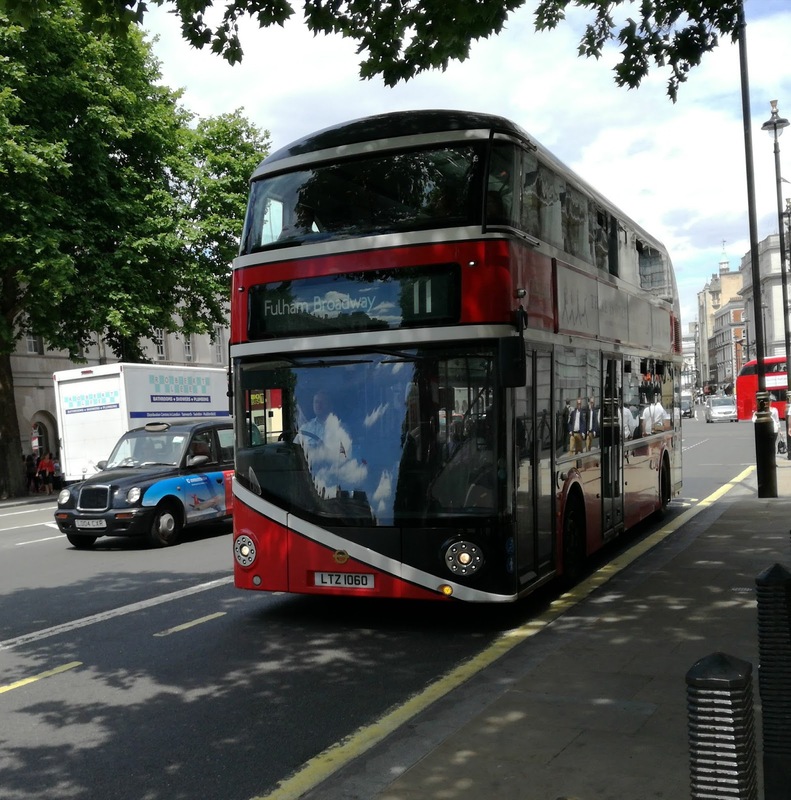 It seems any livery suits the Borismaster but this looked just wonderful in the sun. A perfect end to a wonderful experience, London Midland excepted! And that was that. To complete the circle I had the same Scania Iriza back to Norwich, and reflected on a memorable trip that seemed to last far more than 60 hours. Next one in the planning but doubt it will be for some time. I had no plans to make this post so long, but there are other things to report this coming week. 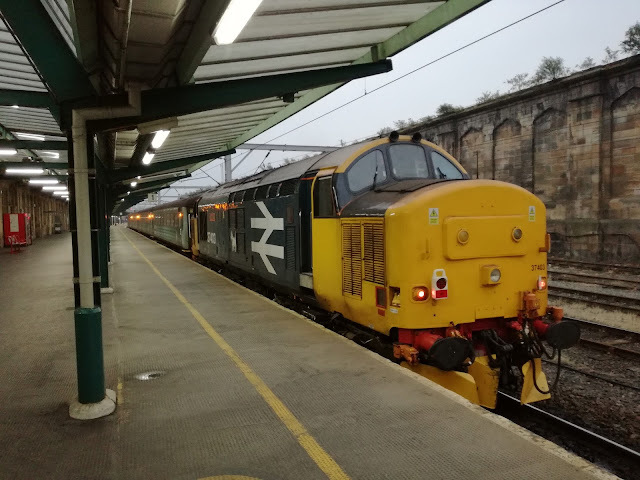 So, as promised here is the 9in video of the night in Carlisle and the 37 at Lancaster. Enjoy.